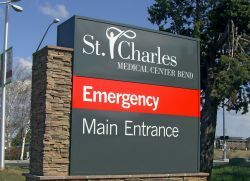 BEND, OR -- St. Charles Medical Center officials say they have submitted a "plan of correction" to the state in response to a recent Oregon Health Authority report that found hundreds of staffing violations. They say the investigation was conducted as part of the hospital's standard three-year survey from OHA, and was partially based on a complaint. Registered Nurse Julie Ostrom is St. Charles Bend’s Nursing Director of Patient Flow. She wasn’t surprised by the Oregon Health Authority’s findings and says most of the violations were clerical in nature. "The largest areas that we have to do work on, we are already doing the work. So, our response to the state is to articulate to them in writing what we’re doing and how we’re going to monitor the progress, and then to demonstrate to them ongoing that we’re improving." She says during the Oregon Health Authority’s investigation, the hospital was already addressing the “Buddy System” practice, which SCMC officials say can temporarily increase the number of patients a nurse cares for, while another nurse takes a mandated break. "There wasn’t anything in that report that pointed to an immediate safety issue where our patients are truly at risk. We have an obligation to protect our nurses from fatigue and ensure that they’re getting the breaks that not only they’re entitled to, but we want them to have for their own wellbeing. But, those problems are long-standing and we have a lot of work going on around them." She tells KBND News, "What we lacked when the state was here was a clear, articulated plan for how and when it’s appropriate to use the Buddy System. It is a strategy that we use to cover meal and rest breaks when the patient-care scenarios are appropriate to combine nurses’ assignments." Ostrom says the vast majority of the needed corrections relate to administrative issues with the hospital’s staffing committee. "The requirements around the committee are fairly new. This version of the law was passed last year, with the administrative rules in effect in January; so we’re learning as we go. So, the bulk of our plan of correction is responding to how we’re going to clean up that documentation and, really, committee function process." 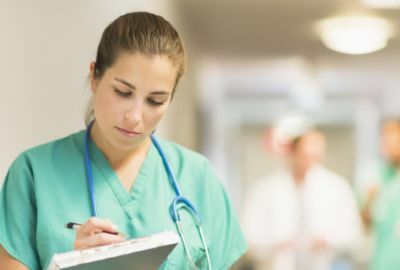 She says administrators want to work with nurses and the union to create a collaborative response to the concerns raised in the recent report. BEND, OR -- The Oregon Health Authority uncovered hundreds of staffing violations at St Charles Bend, according to a recent state report. St Charles Bend nurses filed a complaint about inadequate staffing levels partly prompting the months-long investigation. Acording to Kevin Mealy, with the Oregon Nurses Association, the complaints were about the hospital's use of 'the buddy system,' which he says can double a nurse's patient-load. He says the state also found issues with improperly filed reports by the hospital staffing committee, misuse of mandatory overtime, and inadequate recordkeeping. "One of the many violations that the Oregon health authority found was that the staffing committee had left large blank spots in terms of if they were approving plans, if they weren't approving plans, and then in some cases, what were the guidelines used to determine if they'd come up with a safe staffing matrix." The hospital staffing committee comes up with plans that dictate the ratios of nurses to patients, depending on how much care each patient needs. "We know that St. Charles has budgetary concerns as well, now," says Mealy, "And that's why we're very hopeful that this can be a collaborative process and that it involves the front line caregivers - nurses - and other caregivers that have the best insight into how to fix it and make sure that it stays that way." He tells KBND News, "The full report's 40-some pages and I've read it a lot and I think there's a number of easy fixes. But, there's a lot of cultural change that will be required, and that can't be an 'us versus them' solution, it needs to be an 'everybody's pulling on the same oar to get this done,' and I hope that there's a willingness to do that at this point." St. Charles officials say they have submitted a required "plan of correction" to the state. The Oregon Health Authority will follow up to determine if there's been progress between St. Charles and the nurses in the next 30 days. 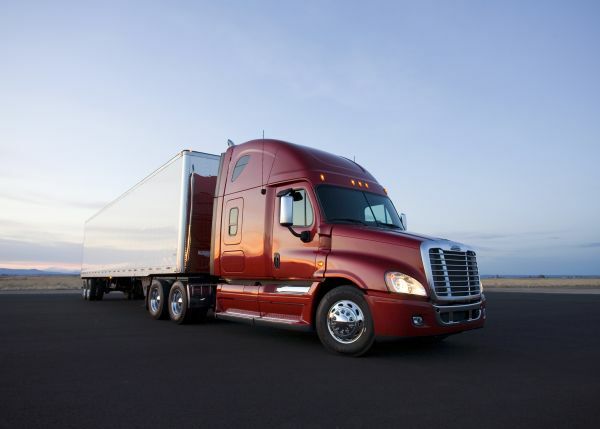 MADRAS, OR -- Daimler Trucks North America is using cutting-edge technology to try and improve braking and fuel economy in semi trucks. The company is testing the tech at the Daimler test track in Madras. Paige Jarmer of Daimler says this is the first step in partnering drivers, to enhance efficiency and improve safety within vehicle convoys, "We call it 'pairing,' and what we're doing is testing the possibility of having these two trucks follow each other at a distance that would be much closer than what would be possible under normal circumstances - to cut braking times down to .2 or .3 seconds." She tells KBND News, "Just to put that into perspective, a human's reaction time is more like one or two seconds." Jarmer says the trucks are being tested following each other at a much shorter distance of only 50 feet, much closer than semis follow in real-world conditions. She insists the goal is not to create a driverless truck, but to improve current systems. 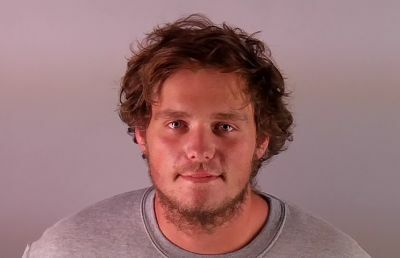 BEND, OR -- A 19-year-old Bend man faces attempted murder charges after allegedly stabbing his father in the back. Anthony King called 911 Thursday night at about 8:20, to report he'd been stabbed with a knife by his son Ian. The 57-year-old victim left the house until police arrived. He was treated by medics for non-life threatening but serious injuries, and was taken by his wife to the hospital. Detectives attempted to contact Ian King, who initially refused to leave the house on Woodhaven Avenue. After about five minutes, he came out and was arrested without incident. He was lodged at the Deschutes County Jail for Attempted Murder, Assault II and Unlawful Use of a Weapon. REDMOND, OR -- Oregon’s stricter distracted driving law takes effect Sunday. Redmond Police Lt. Curtis Chambers says it closes a big loophole. "The current law prohibits ‘use.’ The Court of Appeals clarified ‘use’ means actively typing out a message or communicating via voice." That meant drivers could still read messages or even scroll through their Facebook feed while behind the wheel. The new law, he says, adds to the current list of illegal behavior, "Holding your phone and looking at your phone while reading a message. Even just holding the phone, even though you may not actively be reading something, is illegal as of October first." And, he says, don’t think you can catch up on your social media feed while stuck in traffic. 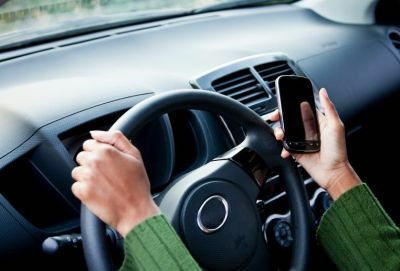 "The law specifically prohibits even using your phone or holding your phone while momentarily stopped at a light, at a stop sign or in traffic." However, the law does allow you to use most mobile devices, as long as you can keep both hands on the wheel. And, there is new technology to help you avoid breaking the law. "There’s plenty of apps out there, either Android or Apple Store products that can inhibit your phone from receiving a text message or Facebook notification or email when you’re going down the road and it senses you’re going down the road." And, Lt. Chambers says talking on the phone or using navigation is still allowed, as long as the driver keeps both hands on the wheel. Fines increase, Sunday, as well. 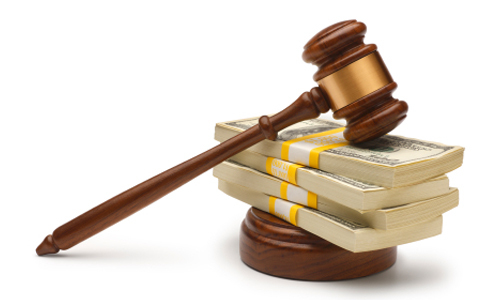 The cost of the first offense goes from $160 to $260; The second time you’re caught, it’s a $435 ticket. REDMOND, OR -- Redmond city officials are considering creating a new bike park. Annie McVay, Redmond’s Parks Division Manager, says the idea stems from a unique visit by a group of kids. "At City Council, just a few months ago, we had a group of about maybe 15 12-year-old boys ride their bikes to City Council to let them know that they have nowhere to ride." McVay acknowledges there are paved trails around town, like in the Dry Canyon, where bikes are welcome, but a new bike park could feature things like a "pump track," with dirt berms and mounds. The city has been working on a Parks Master Plan for several months, but McVay says it’s tough to get feedback from younger residents. "Obviously that demographic isn’t going to come to a community meeting or know to fill out a survey." But, she tells KBND News, their City Council visit made quite an impact. "It was a really great moment, actually. It was very positive. They all rode their bikes and, there’s a big window at City Council, so you can kind of see them ride up and get off their bikes." Planners hope residents will bring ideas for a dedicated bike park to an open house, next week. The American Ramp Company will be on hand, offering residents a look at sample designs and themes. 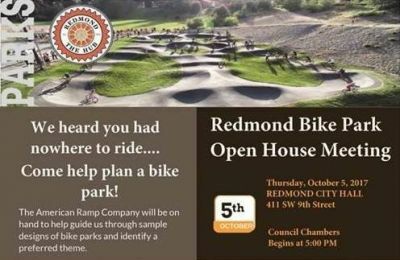 The open house begins at 5 p.m. Thursday (Oct. 5), at Redmond's City Hall. 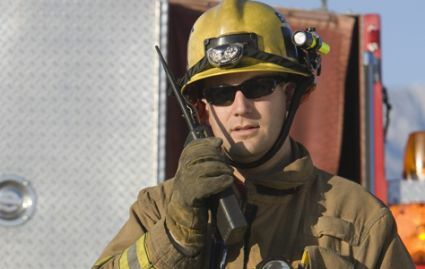 BEND, OR -- Bend Fire has secured a nearly $1.5 million federal grant to help upgrade its communication system. Battalion Chief Dave Howe says the money will help all 12 Central Oregon fire departments. "The radio system that we are in the final stages of upgrading is a regional radio system." He tells KBND News the FCC requires all agencies to convert to digital radios, but the local transition would not have been possible without financial help. "We've been successful in funding some of this with other grant proposals and awards. The final piece of this radio project that needs to be completed is actually buying the radios." Howe says it's important to make sure all local agencies upgrade together. "Especially in the summertime, you never know who you're going to work with when you go on a wildland fire deployment - to Warm Springs or down to La Pine. You may have Cloverdale with you, you may have Sisters, you may have Prineville; and you need to be able to talk to everybody basically to be effective and to be safe." He adds, "If we don't change over from our analog radios to our digital radios, we won't be able to communicate well." Bend Fire had asked for $1.99 million, but Howe says the $1.43 million award is enough to purchase more than 350 portable units, 155 mobile radios for trucks, 89 pagers for volunteer firefighters and 23 base radios. "I would say that we should see radios arriving here in early spring, and to be programmed and installed by late spring/early summer," says Howe. The Assistance to Firefighters Grant is run by FEMA. Deschutes County law enforcement agencies transitioned to digital radios over the summer. 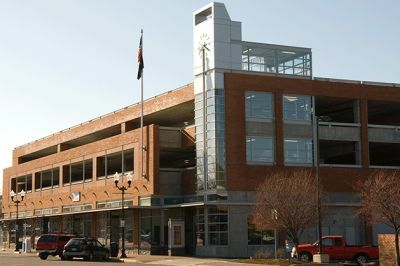 BEND, OR -- A Bend man was arrested Thursday night after allegedly running from a traffic stop and jumping from the Centennial Parking Garage. 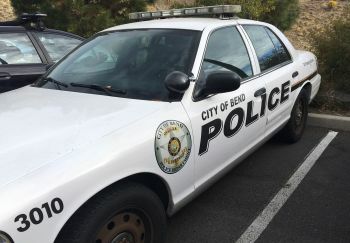 The incident started just before 10 p.m., when a Bend Police officer tried to pull over a car near Second and Franklin. The driver stopped, then ditched the car. Officers set up a perimeter and saw the suspect run into the parking garage. Despite being ordered to stop, he leapt over a concrete wall. The pursuing officer noted the 16-foot drop and took the stairs down; another officer caught 23-year-old James Colton Black on the lower level. He was taken to the hospital for obvious injuries sustained in the fall. Black had an outstanding warrant and now faces a number of new charges. BEND, OR -- Deschutes County Search and Rescue helped a lost hiker near Tam McArthur Rim Trail, earlier this week. Vanessa Collier first called non-emergency dispatch at about 4:30 Wednesday afternoon to report she'd been hiking for a few hours near Broken Top and had lost the trail in the snow. The 39-year-old Redmond woman was prepared for the weather, although her shoes were wet. Attempts to orient her by phone and text were unsuccessful due to poor reception. Her cell phone battery was soon exhausted and a portable charger malfunctioned. SAR volunteers searched through the night, assisted by an AirLink helicopter and Collier was found at the Todd Lake Trailhead at about 2:30 a.m. She'd successfully started a small warming fire and was waiting for rescuers. MADRAS, OR -- We’re learning more about raids conducted by federal agents on homes in Madras and Redmond, earlier this week. Nine people appeared in federal court in Eugene, Thursday. 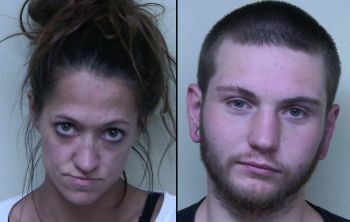 They face charges related to an alleged drug distribution network. Three others were arrested on local and state charges. Agents identified 11 "drug-endangered" minors; five were taken into custody by Jefferson County Child Welfare. The joint operation involved the FBI, Drug Enforcement Agency (DEA) and Central Oregon Drug Enforcement (CODE) Team. The investigation began in 2016, and the FBI believes the network trafficked heroin and meth throughout the region. In a series of searches conducted in conjunction with Wednesday's arrests, investigators also recovered 10 weapons. Click HERE to read details released by the FBI. 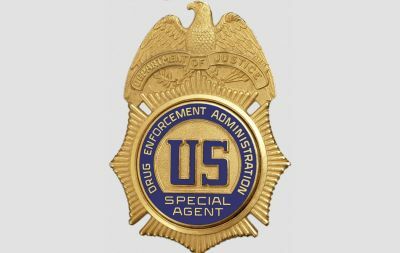 "This unified law enforcement effort is a significant step in dismantling a drug trafficking organization profiting off the destruction of families and communities in Central Oregon suffering the ravages of drug addiction," U.S. Attorney Billy Williams said in a statement. Prior to Wednesday's raids, CODE arrested Colt Sipp, of Umatilla, on state charges; he now also faces federal charges for possession with intent to distribute meth. Investigators believe Lima and Dominguez operated two cells in Madras, serving as distributors of meth and heroin to a large customer base in the region. They believe the rest of the defendants served under Lima and Dominguez to move drugs to lower-level sellers and users. "The successful operation this week was designed to counter the emerging threat in Central Oregon against organized crime fueled by methamphetamine and heroin trafficking," DEA Special Agent in Charge Keith Weis said in a statement. 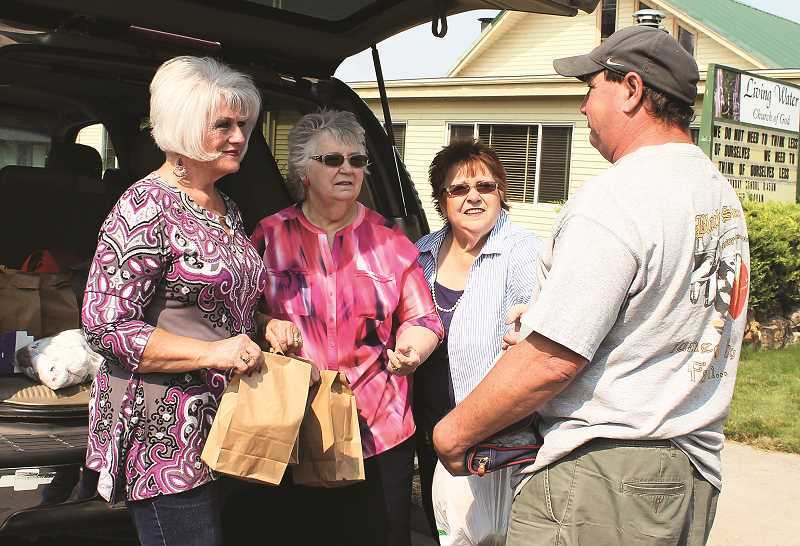 PRINEVILLE, OR -- the Prineville ELKS Club will host a fundraiser this weekend to help a group dubbed the 'Ladies on Wheels' ... three women who've handed out nearly 10,000 free lunches for the homeless in Prineville. Bob Helton, an ELKS Knight, watched the ladies in action and decided he wanted to be part of their mission. "They don't do this for any notoriety or anything. They're just very wonderful ladies who have taken it upon themselves and out of their own pocketbooks to help these people that are less fortunate." Helton says the Ladies deserve support as their mission is important to the area. "The ELKS, here in Prineville and all over, helping other people is the core of elkdom. And, I thought, well, as wonderful as these ladies are, we should put on a fundraiser for them, so Saturday, September 30th, we're going to have a beef brisket dinner, and all the proceeds go to these ladies." To donate to the Ladies on Wheels, drop something by the ELKS Lodge in Prineville, or send a check to Prineville Elks at PO Box 538 Prineville, Oregon 97754. 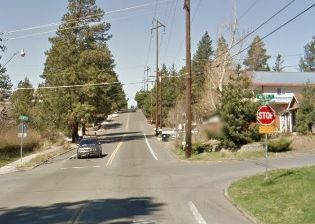 BEND, OR -- Construction has begun on a pedestrian underpass on Cascade Lakes Highway, west of Bend. Peter Murphy, with the Oregon Department of Transportation, says the undercrossing and adjoining trail are especially important for those with limited mobility. "The Forest Service and ODOT are really partners on this. We do partnership on many projects since there's a lot of forest land up here. And, it's a pleasure for us, actually, to work hand-in-hand on something like this project, because what it does, is it provides a way for travelers to get to other parts of the forest than they might ordinarily be able to get to." The Forest Service will begin paving the three-mile trail October 11th and Murphy says it's all about making sure visitors can experience the natural areas easily. "Our specific role is to provide access under the highway, but it links up with other parts of the pathway that return back under the highway, or line up adjacent to the highway, so the transportation corridor that we have, now becomes multi-purpose. So, that's a good thing. It provides access for so many more people that we're happy to be part of it." Marcum and Sons, a construction company, has been awarded $700,000 to complete the project. Murphy says the project will allow people to safely cross the highway near Rimrock Trailhead. "This kind of undercrossing that we're putting in and the kind of path that the Forest Service is putting in, really extends the ability for people who have issues getting into the forest and to be able to get out into areas they wouldn't normally be able to experience. Right now, what we're trying to do, is punch a hole under the highway, and make it suitable for people to travel across the highway, without coming into conflict with motor vehicles." Visitors to Rimrock Trailhead should be aware that it will be closed from October 4th through the 21st for construction, with the paving of the trail beginning October 11th, but the area and the underpass will be available for use this year. BEND, OR -- Bend has a new millionaire. James McGinnis bought a lottery ticket at Binky’s for the September 16 Powerball drawing. He had the right numbers (17-18-24-25-31) but lost out on the $133 million dollar jackpot because he missed the Powerball of 24. However, because he spent an extra dollar on the "Power Play" option, McGinnis' one-million-dollar “second place” prize became $2 million. 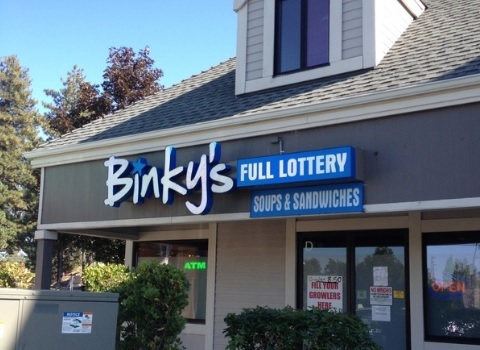 Binky’s in Bend gets $20,000 for selling the winning ticket. 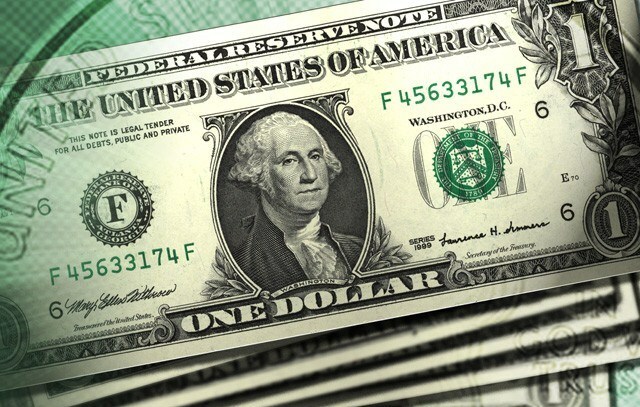 A woman from Colorado won the September 16 jackpot of $133.2 million. She has used the same numbers for 30 years - the birthdays of her children and loved ones. BEND, OR -- The timeframe to sign up for individual health coverage is shorter this year - open enrollment runs from November 1-December 15, for those seeking insurance through the individual marketplace. Medicare open enrollment is October 15-December 7. The state will host local workshops next week, in Madras, Prineville and Bend. Insurance Field Officer Miranda Mathae leads the "Health Insurance 101" events. She tells KBND News, "'Health Insurance 101' is about giving the public the information and the resources that they need to be able to access health insurance." She adds, "In the workshop, what we cover is what the different health insurance options in the state of Oregon are, and under each individual type of insurance, how health insurance works." Mathae says this year's 45-day enrollment period is much shorter than before, which means it's important to get health insurance figured out sooner rather than later. 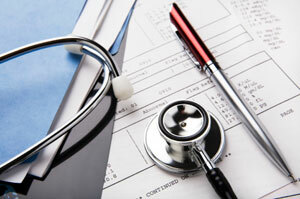 "The new time frame to enroll in a qualified health plan is now November first through December 15. Last year, it was through the end of January." A second event at the Bend library will take place 11:30-12:30, October 25. To register, call 855-268-3767, email info.marketplace@oregon.gov or click HERE. BEND, OR (Sept. 28, 2017) -- Internal investigations continue to plague the Deschutes County Sheriff’s Office. Sheriff Shane Nelson confirms there are several ongoing cases, one involves a Lieutenant now on Administrative Leave. "That’s a very intricate investigation that took a lot of work and it was – not in a criminal aspect – but it was linked to a former captain’s investigation," Nelson tells KBND News. "So, there’s a lot of material to pour through, there." He says investigators are also still looking into allegations involving Deputy Eric Kozowski, who ran against Nelson in the last election. "He’s on administrative leave pending the outcome of the internal affairs investigations." Sheriff Nelson adds, "I can’t release specifics because I want to maintain the integrity of those investigations. But, they have to do with personnel issues and policy violations." The Sheriff asked an outside agency to look into the alleged violations in late November, although he would not confirm how many violations there are. Kozowski was put on leave this week. Sheriff Nelson insists the investigations are not in retaliation for Kozowski’s campaign. "When people violate our policies, or in some cases break the law, the citizens expect me to hold those folks accountable. We are in a high integrity, high liability business and so it is absolutely important our teammates follow the rules." To hear our full conversation with Sheriff Shane Nelson, click HERE or visit our Podcast Page. "Deputy Eric Kozowski was placed on paid administrative leave last week pending the outcome of multiple Internal Affairs investigations. These investigations were conducted by outside investigators hired by the Sheriff's Office and an investigator from the District Attorney's Office. Several of these investigations stemmed from citizen complaints and several of these investigations have been active for over a year. To ensure impartiality the Sheriff's Office does not dictate the timeline when we hire an outside investigator. Sheriff's Office Command and County Legal Counsel reviewed the investigation. As part of the Internal Affairs process, Deputy Kozowski was placed on paid administrative leave. When the Sheriff's Office receives complaints, we look into every complaint for violations of our policy as well as adherence to our mission and values. This is what is expected by the citizens we serve and ensures transparency." 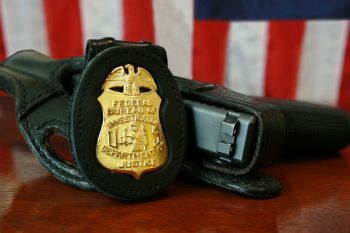 MADRAS, OR -- The FBI, Federal Drug Enforcement Agency (DEA) and Central Oregon Drug Enforcement (CODE) team served a series of search warrants, early Wednesday morning, making about a dozen arrests. FBI Spokeswoman Beth Anne Steele tells KBND News due to the nature of the events and because charging documents and warrants are sealed, she’s unable to release many details. However, she confirms nine people were arrested on federal criminal charges; three others were taken into custody on state and local charges. Most of the arrests were made at properties in Madras, Redmond and surrounding areas. The investigation is ongoing and Steele anticipates those arrested in the operation will appear in federal court Thursday in Eugene. BEND, OR -- A state-wide hospitality association has filed suit against the City of Bend alleging the City spent money earmarked for tourism promotion on other budget items. President and CEO of Oregon Restaurant and Lodging Association, Jason Brandt, says that before 2013, 70% of the 9% room tax could be spent at the City's discretion, but 30% was to be set aside for tourism promotions. Then, voters passed a measure raising the room tax from 9% to 10.4% percent, with the additional 1.4% percent earmarked in exactly the opposite way, requiring 70% to go to promotions. Brandt says he understands that governments have a lot to cover, but that can't excuse reallocating specified funds. "We do feel for governments, and we want to make sure we are a good partner. Having said that, we have a responsibility as an association, to make sure we have the backs of the industry." The City of Bend passed an ordinance this last May changing the allocation percentage to be the same for the entire 10.4% room tax, which is why the ORLA has filed the lawsuit, as the City seems to believe their threshold is 30% of the total room tax, without the distinctions voted into law in 2013. "Moving forward with this has more to do with making sure that we're sending a clear message that certainly they're having challenges making sure their budgets are balanced, and we're just trying to make sure that everyone understands that the lodging tax revenue, the portion of it that is restricted, is not an appropriate place to look to solve budget woes that are impacting communities right now." The City of Bend issued a statement regarding the suit, disagreeing with ORLA's characterization of how the tax is supposed to be disbursed, so Brandt believes the City was probably attempting to make up for budget shortfalls, but he says they can't rob Peter to pay Paul. "When tourism does great, that pot of money continues to go up and up, providing jobs and great opportunities for employment for people in the region. We're big fans of the power of tourism. It's something that I think Oregon is doing right, and we want to make sure we keep on doing it right." In round numbers, Brandt says the approximate amount of money brought in through that room tax is $10 million, of which the City of Bend can spend $6.5 million on anything it chooses, with the remaining $3.5 million going solely to promotion. REDMOND, OR -- Redmond students are raising money to help hurricane victims in Texas. Ridgeview High School teacher Ben Parsons says the fundraising campaign started with kids in the AVID college-prep program. "They weren’t really sure what they could do but they want to do something, and we found a way to adopt a school that was severely damaged by Hurricane Harvey." 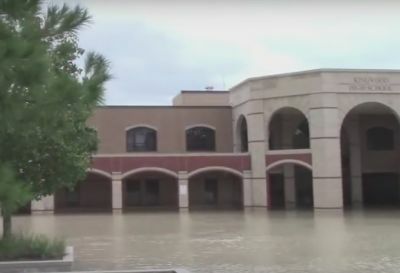 Parsons says Kingwood High School, outside Houston, was nearly destroyed and its students are now attending class in split-shifts at a nearby high school. "Their sports are all disrupted; it sounds like it’s kind of chaos but they’re making it work the best they can. But, they’re going to have to do that all year because their school will not be fixed in time for the end of the school year." Click HERE to watch a YouTube video on the school's damage. Parsons tells KBND News, "In the school of 2600 kids, about 1700 of the homes were destroyed. So, well over half of the kids are without a home and they’re also without a school right now. So, it’s a really, really tough situation for those kids and for those families." Ridgeview students will collect cash donations this week, as part of homecoming, "We’re trying to raise as much money as possible to buy essential supplies for the kids. A lot of the stuff was lost, obviously, in the hurricane. So, we’re going to buy backpacks and binders and pencils, as well as just straight cash directly to the school." Parsons acknowledges it's a short timeline, but says, "We want to get the money to them so they can start using it now. I mean, they need these supplies now." The fundraiser isn't just for Ridgeview students. "Anyone can contribute who wants to," says Parsons. "If you stop by Ridgeview, we have containers for collections right at the front office, staff’s already donating pretty generously, we’ve had the public coming into our office who will throw some money in the jar." Earlier this week, Redmond Proficiency Academy held a coin drive and gathered supplies to send to Harvey victims in Texas, as well. UPDATE (10/5/17) -- Ben Parsons reports the Ridgeview High School effort raised a total of $2,600 to help students at Kingwood High School in Texas. 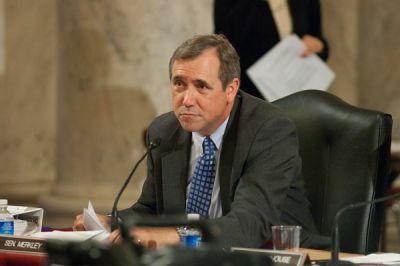 WASHINGTON, D.C. -- Senator Jeff Merkley (D-OR) is concerned about recent statements made by North Korean leaders. Earlier this week, North Korea’s Foreign Minister said President Trump has “declared war” on the country. Merkley, a member of the Senate Foreign Relations Committee, says it reinforces how critical it is that the U.S. be strategic and thoughtful in its approach. He's calling for additional sanctions against the country and says the long-term goal must be to de-nuclearize the Korean peninsula. “As we know, North Korea is a malignant and destabilizing force within the region. These remarks from the North Korean foreign minister reinforce how critical it is that the U.S. be strategic and thoughtful in its approach. Unfortunately, they also remind us that when President Trump instead makes belligerent, shoot-from-the-hip comments like ‘Little Rocket Man’ and ‘they won’t be around much longer,’ it only plays into Kim Jong-Un’s hand and further endangers Americans and our allies. “North Korea has nuclear weapons and a sizable artillery aimed at Seoul, with a metropolitan area population of 25 million, just 35 miles away. There is no military option that does not immediately endanger the lives of thousands of those living in Seoul, including tens of thousands of Americans. History is littered with millions of lives lost in wars that were blundered into by mistake. The President’s reckless comments not only substantially raise the risk of an armed conflict; they also put a diplomatic solution further from reach by reinforcing Kim’s belief and propaganda that his arsenal is the only defense from an existential threat. “Our long-term goal must be to de-nuclearize the Korean peninsula, but our short-term goal should be for North Korea to cease its testing of nuclear warheads and long-range missiles, along with the initiation of negotiations. “To accomplish this, we need international partnership in economic sanctions that persuade Kim Jong-un that the survival of his regime is at stake. Those additional sanctions must include the shut-down of oil imports to North Korea. They should also include the termination of employment contracts for overseas North Korean workers, which North Korea uses to generate large amounts of hard currency; the end of student visas for elite North Korean families, a highly valued privilege; a crackdown on cross-border smuggling of goods; and full support for protecting North Korean defectors, who China now returns to North Korea where they face certain punishment. “For this strategy to be effective, North Korea must believe that the U.S. will keep its word if we reach an agreement. I am extremely troubled, therefore, that the Trump Administration is signaling it may pull out of the Iran agreement next month, at a critical point in our navigation of this escalating North Korean crisis. Pulling out of the Iran agreement would send exactly the wrong signal at the wrong time, and I am concerned that it will only inspire the North Korean regime to accelerate their race to a long-range nuclear missile. BEND, OR -- The Bend-La Pine School board has agreed on a long-term location for two small high school programs set to open next year. Assistant Superintendent Lora Nordquist tells KBND News, "The programs are starting in the fall of 2018, so we’ve located space in the industrial area off Brinson, in northeast Bend and have procured a lease there. And, that lease can continue for a number of years." The new "small school" programs do not replace the traditional "large" high school that's expected to be built by 2021. Construction of that facility is funded by a bond passed by voters last year. Nordquist says leasing space for the smaller programs allows them to stabilize enrollment, "To be sure that we had enough room for all the students we would have in our high schools in the year 2021. It also gives the opportunity to see how the programs thrive and grow. And, if those two small high school programs are successful, ultimately we would look to purchase a building or build a school specifically for those programs, down the road." Nordquist says the small schools are designed for no more than 500 students and are an effort to provide more options for families. "Not every student seeks a large comprehensive high school experience complete with sports and band and a full plate of electives." Click HERE to learn more. She says more information on the specifics of the programs and enrollment will be available later this fall. REDMOND, OR -- A pillar of the Redmond community passed away at his home Tuesday morning, ending his battle with cancer. Bob Eberhard spent several decades as the head of Eberhard’s Dairy, started by his father in the 1950s, and now managed by his nephew, Mark. Eberhard was a well-known businessman in Central Oregon, at one point serving as President of the Redmond Chamber of Commerce. He talked with The Source Weekly's Brian Jennings, earlier this year, about the rise of his family's company, "On August 15, 1951 we moved to Redmond and he started operating The Cream Station. So then, he would go out four days a week and pick up cream; my mother was in the office and my brother Jack and I were in high school, so we would come down after school and wash the cans by hand. And, that was how we started out." He majored in business at Oregon State and returned to the dairy in 1964 after working out of the area for a few years. The company continued to grow despite several economic downturns in the region, acquiring competing local dairies in 1969 and 1981. "Well, you know what happened in 1981, the economy started going the wrong way," he told Jennings in March. "And yet, we had to buy it at that time if we were going to buy it. Once again, overnight, we had to double our production, our sales doubled and our accounts receivable doubled and our accounts payable doubled." Bob's wife Kaye passed away last year. He’s survived by his daughter and several grandchildren. "To our friends, fans, family and community... it's with heavy hearts that we share the news that Bob Eberhard passed away this morning at his Redmond home, ending his fight with cancer. 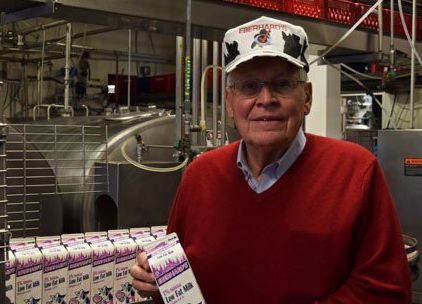 Not only was Bob the family patriarch, as well as the familiar face and voice of Eberhard’s Dairy Products, he was also a big part of our community in many other ways. Service information will be forthcoming, with Redmond Memorial chapel presiding over arrangements. Thank you for all your support, kindness, and well-wishes to our family at this time." To listen to the full March 2017 episode of Take Five with Bob Eberhard, visit our Podcast Page. 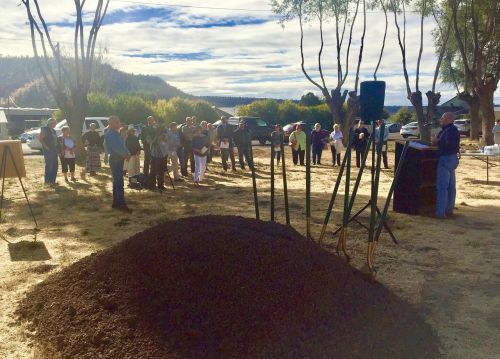 PRINEVILLE, OR -- Redemption House Ministries broke ground on its new homeless shelter in Prineville yesterday. Ken Fahlgren is a member of the Public Safety Coordinating Council and has been heavily involved in moving the men's shelter to the new location on Madras Highway. He says the next step is to get the modular building in place. "I'm looking forward to actually getting this site finalized, ready to go, probably have it open in November sometime." The men who use the shelter will have access to programs ranging from job training to drug and alcohol treatment. Redemption House Ministries also has a Food Kitchen and a Women's Shelter in Prineville. Fahlgren, a former Crook County Commissioner, has worked with Redemption House Ministries to create a place for men who need 'a hand up' to get the tools they need to improve their lives. "It's a 90-day transitional plan. The goal is to get them into more permanent housing, and into jobs, and back into society, so they'll be working with the board and their team, but they'll also be working with behavioral health people with community services, and alcohol and drug treatment as well through the County. The services will be in one place, and that will make a huge difference for them." Fahlgren says the modular building will be installed on the property the first week of October and should be ready for the 16 men it will house to move in sometime in November. 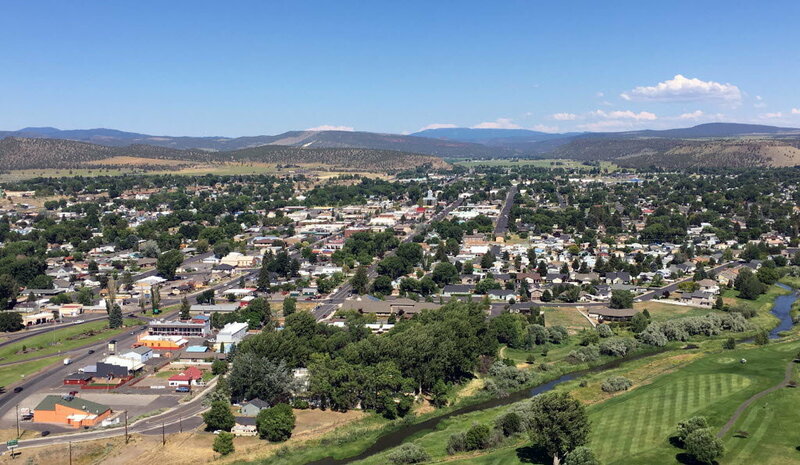 PRINEVILLE, OR -- In the interest of economic development for Crook County, the county is requesting a 38-acre Urban Growth Boundary expansion from the City of Prineville tonight at a public hearing. Ann Beier, with the County, says in the interest of attracting larger industries, this expansion provides another option for development. "It's property that the county owns that's adjacent to City limits, and we need to go through a land use process of bringing that property into the Urban Growth Boundary of the City of Prineville, and eventually into the City limits, so that it can be developed for industrial use, and so the City of Prineville can provide City-level services, like water and sewer." Beier says it's those services that will make the parcel attractive to larger industries. "The City and the County are both interested in having industrial land available for economic development, and I think there's good support on both the county and city level to bring in land for industrial development." The county and city leaders met last week and agreed unanimously in committee to adopt the request. A joint City and County public hearing on the expansion is scheduled for 5:15 pm tonight at Prineville City Hall. UDPATE: The Ochoco National Forest has rescheduled the prescribed burn for Wednesday and Thursday, due to wet fuels. PAULINA, OR (09/25/17) -- Fire managers plan to take advantage of last week’s rain and conduct a 3,800-acre prescribed burn in the Ochocos, this week. 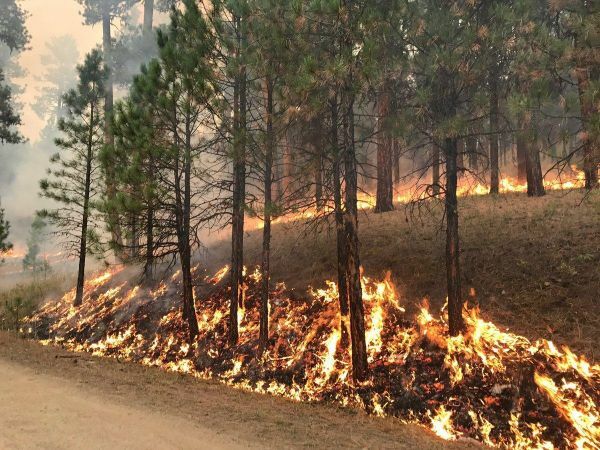 "The Forest Service recognizes that ‘boy, we just got out of this really big fire season,’ and people are really tired of dealing smoke; they’re really tired of hearing about fire," says Patrick Lair, with the Ochoco National Forest. "But, this little window of opportunity is probably the last one we’re going to have this year." He points to this fire season as an example of the importance of fuels reduction work. Lair says Crews burned the boundary of the unit last fall, but a big rain event forced them to push the rest of the project to this year. "We have very narrow windows of opportunity to complete prescribed burning, where the fuels are wet enough that they won’t really take off running if they catch on fire, but they’re dry enough so they will burn." And, he tells KBND News, it's also the perfect time to have the least amount of impact on hunters. "Fall hunting is a really big deal in the Ochocos; people come from all over for the deer and elk hunt, here. This is the week that falls in between archery and rifle deer season, and it also happens to line up with expected weather and fuel conditions that could be just right for getting this burn done." Weather permitting, crews will start ignitions around 11 a.m. Tuesday, south of Black Canon Wilderness. Smoke could linger near Paulina through the end of the week. 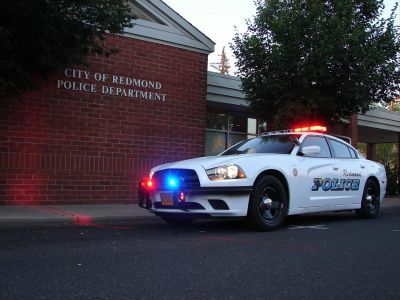 REDMOND, OR -- Redmond Police are trying to rally support for a proposal that could increase staffing. Lt. Curtis Chambers says the idea of a public safety fee to help fund the hiring of more officers is not unique. "There’s 11 other municipalities across the state that have a fee in place on a utility bill that comes to every residence or business, every month," Gresham and Medford are among those cities with such a fee. "And, on that bill would be, if passed by City Council, a $6 fee to specifically fund police officers out on the roads of the city of Redmond." Lt. Chambers tells KBND News property taxes are no longer enough, "Revenue is not keeping up with demand. The city of Redmond budget, for the last five years, has remained flat and costs continue to increase. Redmond is growing; there are more houses coming on to the tax rolls, each and every year. But, the amount of revenue that the city receives from those property taxes every year is not keeping up with the cost of services. property tax revenues are not keeping pace with the need to increase the number of officers on patrol." He adds, "We would like to bring on six; we could justify bringing on eight more. It would be slightly over $800,000 for six officers; $1.2 million for eight officers." The department will meet with citizens and get feedback from surveys at various events before reporting back to Council in late December or January. He expects Council wouldn't vote on a proposal until January, at the earliest. "If the City Council passed that, it would be March before we would see it on any utility bills and we would begin the hiring process soon thereafter." Cllick HERE to listen to our full conversation with Lt. Curtis Chambers, or visit our Podcast Page. 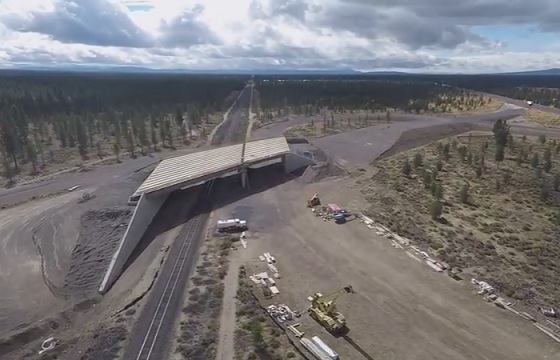 LA PINE, OR -- The Oregon Department of Transportation is working to develop the next steps for the Highway 97 overcrossing at Wickiup Junction. ODOT Engineer Della Mosier says the project stalled in May after tests showed the land under the ramps leading to the new bridge was settling. Although, she admits some movement is expected, "In this case, what we saw was that between March and May the settlement not only wasn’t slowing down, it appeared to be speeding up, which was a red flag for us." Testing by geotechnical experts determined the structure was being built over an ancient lake. 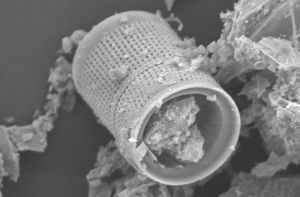 Darren Beckstrand, Geologist with Cornforth Consultants, says they found a unique combination of ash, pumice, silt and the skeletons of microscopic organisms known as diatoms (right). Under the weight of the project, he says the material is reorienting, causing unpredictable shifting of the soil. "There’s not a lot of information on it; there’s not a lot of large construction on these types of materials in the U.S."
ODOT Director Matthew Garrett says the agency couldn’t have known in advance because standard geotechnical analysis conducted prior to the start of such a project does not include the use of a scanning electron microscope and x-ray diffraction that discovered the problem. "I think we need to continue to ask ourselves, ‘what else could we have done, if anything?’ Things happen. I want to make sure, given a situation like that, that we know what we need to do so we don’t have another experience like we’re seeing out at Wickiup, here." Click HERE to view ODOT's latest YouTube video on the project. The agency has spent $13 million on the project, so far. ODOT plans to ask the state Transportation Commission to approve the complete removal of the overcrossing and look at another way to take Highway 97 traffic over the railroad tracks, north of La Pine. LA PINE, OR -- The search continues for a La Pine man missing for several weeks. Over the weekend, Deschutes County Search and Rescue Volunteers returned to the area near Davis Lake where Gary Humbard’s vehicle was found. They used multiple K9 teams and a drone, and even had support from Crook County's Search and Rescue unit, but they found no sign of 61-year-old Humbard, nor do they know which direction he traveled after leaving his car. The case remains open and officials say future searches will occur as conditions allow. Anyone with information is asked to call non-emergency dispatch at 541-693-6911. PRINEVILLE, OR -- Two Prineville residents face charges following a Crook County pursuit that ended with a Sergeant drawing his weapon. The Crook County Sheriff's Sergeant tried to pull over a car late Sunday night for failing to stop at a stop sign at NW Gerke and Madras Highway. The car sped north on Madras Highway, then east on Ryegrass Road before spinning out of control. The driver - later identified as 26-year-old Shelly Wickman - tried to get around the Sheriff's Office vehicle by driving in a ditch but was stopped by a fence. The sergeant blocked her in with his car. As he approached the suspect vehicle, Wickman allegedly put her car in reverse and struck the patrol car. She eventually complied with orders to shut off the engine, and he held Wickman and her 22-year-old passenger at gunpoint until backup arrived. Wickman is charged with Attempt to Elude and Reckless Driving. Her passenger, Danjero Shetler, was arrested on a parole and probation detainer. SISTERS, OR -- Members of the Grand Peaks pickleball community in Sisters is raising money to help those affected by Hurricanes Harvey and Irma, as well as fires in Central Oregon and Montana. Grand Peaks Partner, Neil Amondson, says we're all one emergency or natural disaster away from needing assistance ourselves, and this is the best way he knows to help. "We established the fund through Saint Luke in Chicago that gives 100% directly to the need. And, we don't necessarily know people directly, but we have a fraternity established through pickleball, and thought this is a great way to help, and possibly give back." So far, the fund has raised $10,700. If you would like to give, click HERE. 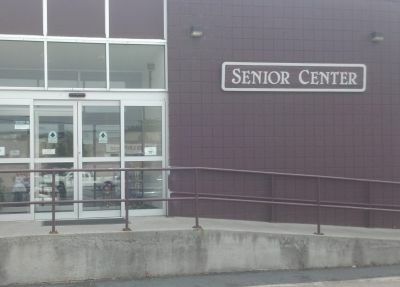 Amondson tells KBND News, "There's a need for everybody and not just pickleball players, but we have a connection with pickleball there, so we're reaching out to other pickleball players across the country and saying, 'why don't you join us in helping those in need?' there's just so many things happening, that we thought this is a small way we could help." 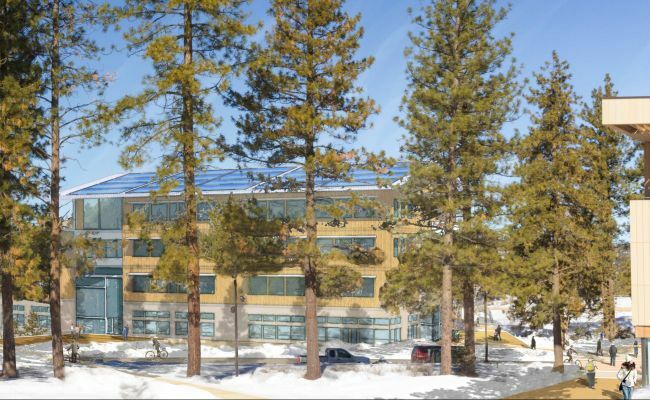 The developer of Grand Peaks, Hunter Renaissance Development, has also started campaigns to honor and support military veterans and soldiers, as well as assist with affordable housing programs. There are currently 2.5 million pickleballers in the nation, and Amondson says there could be as many as 8 million by next year. BEND, OR -- 27th Street has been under construction since July of 2016, and the end of the road work is finally in sight. Eric Forster, with the City of Bend says the project is only about two weeks from finishing. "Specifically, 27th and Reed Market will be open no later than October 6th, so we're looking to maybe beat that, but we're on schedule to make that date." He says there's some detail work to complete on Bear Creek and 27th, and some night work to finish at the intersection of 27th with Neff Rd. "We are just doing the last little bits. We're going to have some punch list items and then we are going to have all of 27th reopened." The Sewer Line Project has stretched along 27th Street from Neff Rd. to Reed Market, causing closures, detours, and rerouting, but Eric Forster says there's a final leg of 27th that needs some attention before the City can call the project finished. "The City has another project where they're going to do some grinding and some paving and it's going to go from Reed Market down to Ferguson. So, essentially, from Ferguson to Neff is going to be all new pavement. Now, a lot of that paving is complete. A lot of what you see out there is the final surface." He adds that he knows it's been a long time getting to this point. "I just appreciate everybody's patience on the job. We do have a little bit of touchup work here, and please keep your speeds down, we do have people working alongside the road, and we don't want anybody to get hurt, so just be safe out there." The section of 27th Street stretching from Reed Market south to Ferguson closed this morning for the grinding and repaving portion of the project. BEND, OR -- The state trooper heralded as a hero following a deadly confrontation at the High Desert Museum in May of 2016, was honored for his actions, this weekend. Senior Trooper Richard Brannin was the first officer on scene, a man suffering mental problems took an employee at knifepoint inside the crowded museum. After the suspect was hit twice with a taser and continued to advance with the knife in hand, he was shot and killed by the trooper. 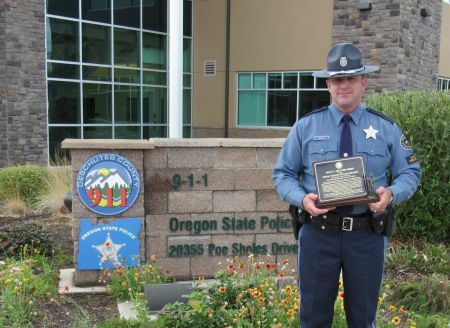 Brannin was honored with the Holly V. Holcomb award, which is given to OSP Troopers who distinguish themselves during a deadly confrontation with an armed and dangerous suspect. The agency said in a statement, "Sr. Trooper Brannin’s conduct and actions, represent the highest standards of an Oregon State Trooper. The courage he displayed in his response to the situation is a testament to the measure and strength of his character and exemplifies the qualities of an Oregon State Trooper." WARM SPRINGS, OR -- A missing psychiatric patient was re-apprehend over the weekend, in Warm Springs. 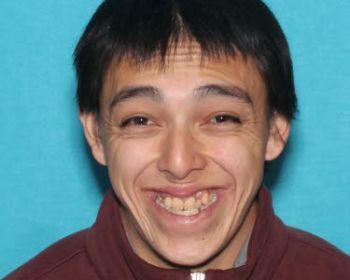 According to Oregon State Police, 22-year-old Rodrick Edminston escaped the custody of a secure transport company Friday, at the Cow Canyon rest area on Highway 97, south of Maupin. They say he was not restrained during the transport and was not armed, although he is classified as schizophrenic and “dangerous.” OSP immediately began a search of the area but couldn’t find the man. Warm Springs Police located Edminston in a restroom near the Kahneeta Resort, Sunday morning. 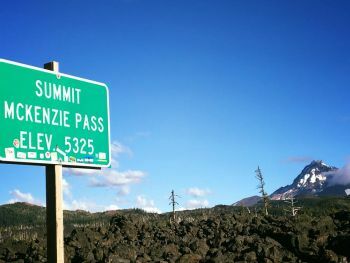 SISTERS, OR -- Old McKenzie Highway, also known as Oregon 242, will remain closed to cars and bicycles until all hazardous trees can be removed and repairs can be made. The road closed in August, in response to the Milli and Separation fires, which destroyed large sections of forestland along the scenic route. The Forest Service is working to identify and remove dead and dying trees that could pose a hazard to the road in the next three to five years. Some of those trees will be made available to the public for firewood. Depending on the weather, officials say the route may be open in time for over-snow travel this winter. Peter Murphy, with the Oregon Department of Transportation, talks about the damage in the Your Town Podcast. Click HERE to listen to the full interview. BEND, OR -- Political hopefuls are starting to make known their intentions and Dr. Nathan Boddie recently joined the fray, announcing his intent to run for Knute Buehler's vacating Representative seat. Boddie, a Georgia native who has lived in Central Oregon for over a decade, and became a member of the Bend City Council in November of 2014, will be running on the Democrat ticket, but he doesn't like labels. "You know, I don't think it has to be so much about what letter is after your name, I think the residents of Bend can decide who a good candidate is, and hopefully they like what I've been doing. You know, they overwhelmingly sent me to Council to represent their interests and that's what I've done. And I want to certainly continue to do my best and that's what I would plan to do in Salem, as well." Boddie says he'd be happy to work with Buehler, as the two have always shared a civil professional relationship, but he believes Kate Brown should continue as Oregon's Governor. Due to Oregon's particular style of governing, Boddie says while some changes will be made to his office should he win, he's confident that he can do both. "Oregon has a, an essentially, a part-time citizen's government, so it's not intended as a full-time position and it's not built that way. And medicine is really the other half, the other side of the coin of how I can best help the community, so I'll continue to help my patients, and I'll continue to help the residents of Bend that aren't my patients in the local government." Boddie, a Bend City Council member since 2014, is running as a pro-choice, pro-second-amendment Democrat but points out that he's represented all the citizens of Bend on the council and plans to continue that practice in Salem. He says, in representing his constituents on the local level, he's learned that his policies are aligned with theirs. "Some of our local representation from Oregon has opposed what's been going on at the State level, I would argue that that's one of the big reasons I want to take this position, because I think that that voice has been out of step with what most people in Bend believe." Boddie will be seeking the Democrat nomination for Knute Buehler's representative seat. LA PINE, OR -- A new effort to repeal and replace Obamacare could get a vote in the Senate as early as next week. Oregon Senator Ron Wyden is a ranking Democrat on the Senate Finance Committee, which is expected to hold a hearing on the new GOP bill Monday. Senator Wyden tells KBND news, "This is extraordinarily important to our state. The independent analyst showed that Oregon would actually be the hardest hit state in the nation, losing about $13 billion in funding, if this legislation becomes law. We are pulling out all the stops to derail this bill." He believes rural Oregon would be most impacted by the Graham-Cassidy Healthcare bill, which would slash Medicaid funding. "I always tell people, ‘Listen to the rural hospitals, listen to the rural doctors, listen to the rural older people for whom this legislation has been a lifeline.’ I had a listening tour just in rural facilities. And, overwhelmingly they said this bill was enormously important." He tells KBND News he's heard from rural hospitals, "They say, ‘because of this bill we were able to hire a staff person and now the waiting lines are not as long for rural seniors'." This latest healthcare bill would reduce federal subsidies for insurers and Medicaid; instead it would provide block grants to states until the year 2027. Only 50 votes are needed to pass the bill until September 30. If it doesn’t go before the full Senate until after October first, Republicans would need 60 votes. Senator Wyden expects healthcare and wildfire funding will be big topics at a Saturday afternoon's town hall meeting in La Pine. It begins at 3 p.m. at the La Pine Community Center (16405 First St.) and is his fourth Deschutes County town hall this year. To hear our full conversation with Wyden, click HERE or visit our Podcast Page. 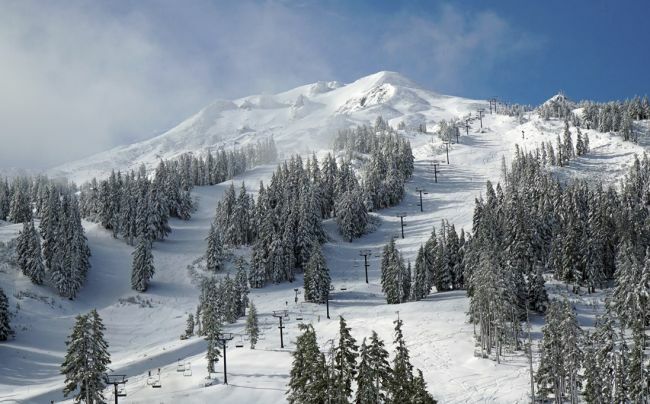 BEND, OR -- Mt Bachelor Resort closed Friday due to extensive snow covering trails and mountain biking is suspended for the weekend. But, the hill will open Saturday and Sunday for what the resort is calling "Snowseeing." Visitors can take a scenic chairlift ride up to mid-mountain while it's snow covered. The Pine Marten lift will be open 11 a.m. to 5 p.m. Season ticket holders ride for free, others can purchase tickets. Crews are also working on a few features in a designated area for tubing. The free, walk-up tubing park will be available Saturday. Mt. Bachelor's parking lot is open, but only partially plowed. General Manager John McLeod says, "Although only temporary, the snow is exciting and a spectacular departure from our hazy, smoke filled days of late. Come up, take a chair ride, hit some jibs or even make a snowman, but most importantly enjoy your mountain this weekend." He believes the snow will melt as temperatures warm next week, and downhill trails will reopen for the final two weeks of the planned biking season. BEND, OR -- Bend’s Charter Review Committee is moving full-speed ahead toward creating recommendations for a 2018 ballot measure. City Manager Eric King says they appear to agree on the need for a directly elected mayor, but there remains a lot of discussion around how voters would select City Councilors in the future. "I think the committee seems to narrow in on either four or six wards. Those could take a variety of forms: they could be four quadrants of the city based on the directional indicators, or it could be this idea of a Super ward – where you might have the four wards and then an overlay of maybe one councilor representing the south side of Bend and then then north side. You could also, perhaps, two elected officials per ward so you don’t have complete turnover when you have an election." Committee members are working to narrow down all those options, "Right now, what the committee is doing is interviewing cities, mainly here in Oregon, that have a ward system; or maybe they had a ward system and they don’t have one anymore," says King. "There are other local entities that this committee is interviewing, including the school district and COCC. Both of those entities have elected officials by district." Those regional districts are very similar to "wards." He says there's no talk of changing the total number of Councilors. Voters would get the final say on any revisions to the city’s charter, which could happen as soon as the May 2018 election. However, there are still questions as to when those changes would take effect. "We also have to look at the election cycles," King tells KBND News. "We have three positions that are up in 2018. So, how you would implement a system based on three folks, and if one of them is a directly elected mayor, do the other two become two that represent wards. Or, do we move in 2020 to elect all? If we’re doing four wards, the most logical time to do that would be 2020." The committee is expected to update Councilors on their progress October fourth. Click HERE to listen to our full conversation with Bend City Manager Eric King, or visit our Podcast Page. BEND, OR -- Humidity is the firefighter's best friend, but Central Oregon's arid summer conditions aren't over yet. Dave Howe, Bend Fire Battalion Chief, says the weather is supposed to get warmer again, which means the humidity levels will go down. He says there are different kinds of fuel, classified by the number of hours in windy and dry conditions that it takes them to be ready to catch flame once they're entirely saturated with water....thin grasses are considered 'one hour fuels' up to giant logs, or 'thousand hour' fuels. "If we have wet weather, like we do now, and then all of a sudden it gets warmer and it gets windy, it's going to dry those thin fuels out and they'll be nice and dry and ready to burn and our thousand hour fuels, those big logs and the big stuff, will still be available to burn, because the fuel moisture will still be down, it hasn't responded to the moisture yet and we'll be right back into the burning conditions." Howe says that even though the danger classification has gone down from Extreme to High, exercising caution around any controlled fire is the best form of wildfire prevention, and the worst thing that can happen is for people to get complacent with fire just because there's a little rain in the forecast. "What's going to happen with us again next week is the humidity levels are going to drop again, the moisture content of the air is going to drop, and so the moisture content of the fuels will also drop and that will make those fuels more available for ignition." Howe says it takes a surprising amount of moisture in the air for an extended period of time for the threat of wildfire to truly be passed and he stresses continued caution as people light camp and other fires, because as the wind really dries out all the fuel, it puts us in a position where one spark is all it takes to start a new wildfire. "I would say the main thing is basically just to realize that the wildland is still quite flammable and take the necessary precautions, the same precautions you've taken all summer, because the dropping humidity and the dropping fuel moisture can unpleasantly surprise you." As always, if you see smoke, report it. BEND, OR -- As Central Oregon recovers from wildfire season and persistent smoky conditions, local leaders work toward improving how the area manages public lands in an effort to reduce the risk of massive fires. 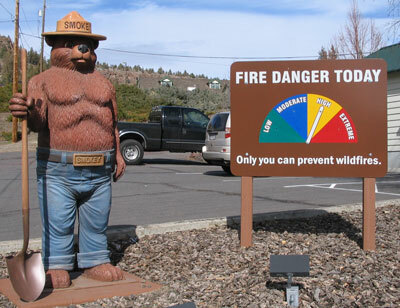 Deschutes County Commissioner Tony DeBone says the State Department of Forestry has a smoke management plan in place that dictates when prescribed burns can be conducted. Those scheduled burns are designed to reduce underbrush and other fuels that can feed wildfires. 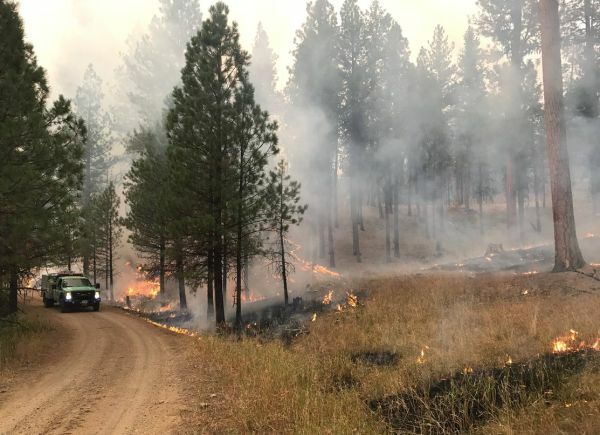 "So, the big picture here is, we, the Central Oregon Collaborative Forest folks, we would like to advocate for more aggressive prescribed burns in the Spring and in the Fall, which makes us more safe when these uncontrolled fires happen in the Summertime." DeBone tells KBND News that, along with additional off-season burns, proper forest management is essential to reducing the number of wildfires, and by extension, the amount of smoke that blows into the region. "The Deschutes County Collaborative Forest Project really has done a good job figuring out what a prescription might be for the forest, and then a sustainable yield; and then when is it appropriate to bring in people to do some of that fire reduction forest management, pull out some wood, and clean it up so it's fire resilient." Wildfire season isn't over yet, and DeBone says the amount of smoke we endured this season proves that what we're currently doing to manage our forests isn't working. "What does it mean to be in trouble when there's smoke that comes from a prescribed burn in the Spring? And, can we relax those requirements so we can allow some more controlled smoke for a day or two in the Spring and it would really help reduce the threat of wildfire in the Summertime when it gets real dry?" Bend City Councilors and Deschutes County Commissioners are writing letters of support to bolster the Deschutes Collaborative Forest Project's recommendations recently sent to the Oregon Smoke Management Review Committee. 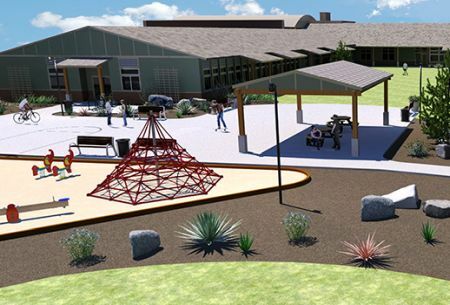 PRINEVILLE, OR -- The first phase of Ochoco Elementary’s transition is underway, as the former school in Prineville converts to an affordable housing apartment complex and community services hub. On Monday, NeighborImpact welcomes students to two Head Start classrooms in what used to be the cafeteria. "It’s the first full-day four-year-old classroom that NeighborImpact Head Start has implemented in our region," Director Kim Snow tells KBND News. "All Head Start programs are expected to transition into a full-day program 100% by the year 2021. We’re trying to make that transition and we just started that this year with two classrooms." The new classes will keep kids 8-3:30 every Monday through Thursday and will have an adjusted calendar, "It’s the first classrooms that we have set up to really align with the Crook County School District schedule; so, when they have days off in Crook County, we’ll have days off at Head Start." Snow says, "It just gives them more one-on-one time with the teachers and staff to be able to support the focus on the different developmental areas." And, while it should make it easier for working parents and families with school-age kids, she recognizes it’ll be a long day for those young students. "They will be having an opportunity to take a rest time, but they don’t have to take a rest time. If they’re not asleep within a specific amount of time, then they can get up and do other activities that might be geared toward their individual goals." Snow says the classroom at their old site near Cecil Sly elementary will remain a half-day program, for now. The new classrooms are in what used to be the cafeteria of Ochoco Elementary. Snow says it’s exciting to be the first to move in to what is now known as Ochoco School Crossing. "How wonderful. The [former] classrooms are just amazing and they’re transitioning those classrooms into low income housing apartments. So, the end result would be for, maybe some of our children and families would have to walk a few feet to come to school because that’s their community." Ochoco School Crossing will also eventually be home to several Crook County Parks and Rec programs. BEND, OR -- Bend City Councilor Nathan Boddie announced Wednesday he plans to run for Bend State Representative Knute Buehler’s House seat. Buehler (R-Bend) was elected to the post in 2014, but said earlier this summer he would not seek re-election to District 54 so he can run against Governor Kate Brown in 2018. Boddie, like Buehler, is a physician. He’s served on the City Council since 2014. 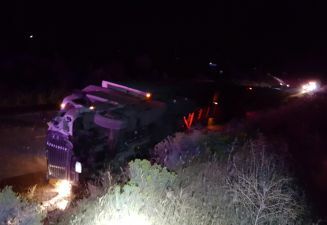 MADRAS, OR -- A Bend-area man was killed in a late-night collision, south of Madras. State troopers responded to Highway 97 near Iris, at about 11:15 p.m., Thursday. 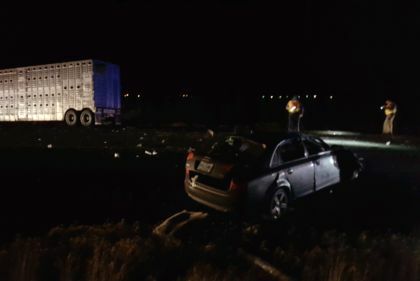 Investigators believe Jonathan Stern was driving northbound when for an unknown reason, his car crossed over the center line and into the path of a semi truck. Stern was pronounced dead at the scene; the truck driver was taken to Redmond St. Charles with minor injuries. The highway was closed for about four hours to allow for the investigation. 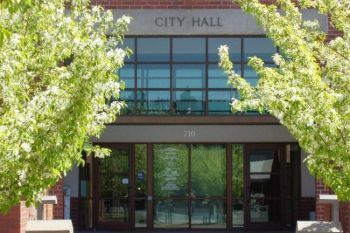 BEND, OR -- The Bend City Council has been working toward a collective action to improve energy efficiency in Bend. Gillian Ockner, with the City, says since the adoption of the Climate Action Resolution a year ago, the city is using a two-pronged approach to make progress. "One is to clean up our house internally, and look for ways to increase our energy efficiency and fuel efficiency of our fleet, and then, how we can utilize our partnerships to develop a plan for the community as a whole by identifying voluntary actions that would address fossil fuel reduction." The Bend City Council is holding a meeting tonight at 5 pm where they will hear updates about the resolution and discuss their next steps to reach their goals of continued fossil fuel reduction and increased energy efficiency. Ockner says part of discussing the City's progress tonight is to involve the community in the process. "What the city has done is try to leverage where we're already convening people around key questions that could affect fossil fuel reduction, such as our recently launched Transportation Plan Update process. That process will encompass how to reduce vehicle miles traveled in the city." The Council will also discuss plans to identify further reduction opportunities, further integrate transportation planning, and seek funding for Community Climate Action planning. According to Ockner, she's heard there are those who think the City should be focusing their attention elsewhere, but she believes reducing dependence on fossil fuels adds value to the community. "We look at key values and how to serve those through fossil fuel use reduction such as how can this help in increases in health, safety, affordability, transportation accessibility, cost reduction and savings, over time, for businesses, and individuals, and the City itself." The City's continuing plans include identifying energy efficiency opportunities, integrating land use and transportation planning, fund raising, and continuing to engage the community in the process. BEND, OR -- Drones are being tested by PanPacific UAS test range complex at Warm Springs, Prineville, and Madras airports, and now at Bend Municipal, too. Liz Stalford of the Warm Springs Test Range, says adding Bend Airport to the test zones will greatly facilitate their success for a variety of factors including after-hours events the drones can view. "It was important to be able to offer our clients an airport for a variety of reasons, for maintenance facilities, and often they need a hard surface. And also, if you're here for a type certification for a couple of years, and you want to move your family, Bend is the optimal place to move. You can actually live here." Stalford says the test sites should go on for several more years and the drones are being tested to determine their viability in carrying passengers, long-range inspection of utilities and wildlife, and fire spotting and monitoring and Stalford says Bend Municipal has several features that make it a great option for PanPacific's clients. "Often, the newer, heavier drones that we're seeing entering the marketplace, need a hard surface, be it a landing pad, or for really tall, for vertical takeoff and lift, or a runway for a fixed-wing operation, so we wanted to be able to give everybody an option." Because of its expansive terrain and sky, Stalford says Central Oregon is a perfect place to do the testing, especially given how easy it's been to communicate with the participating airports. "We're coordinating closely with airport managers, so that fixed-sing and rotor craft pilots know how this new animal that is coming into their sandbox is going to operate safely, what htey can expect by seeing drone activitiy, so to really make sure that our local traffic knows what to expect and watch out for." Drones that weigh more than 55 pounds aren't currently cleared to fly in national airspace, and that's why this testing is so important, to determine how these heavier drones will perform in national airspace. BEND, OR -- Estimates show that there were modest employment gains in August, especially in Jefferson County with the seasonal jobs created by the total solar eclipse event, but, Regional Economist Damon Runberg, says unemployment continues to rise. "So, it sounds like a bit of a contradiction there, how do you have hiring at a higher rate, or a faster rate, than you'd expect, and at the same time, the level of unemployment goes up and the answer is, this continued push of a growing labor force is helping to drive up the unemployment rate, and that's actually a good thing right now." Runberg continues, saying the contradicting numbers are due to more people looking for work, not because businesses are experiencing layoffs. "We saw the unemployment rate actually increase across Central Oregon, significantly so, which means it went up more than just what we'd call 'statistical noise,' we actually saw a substantive increase in the unemployment rate, but at the same time, seasonal hiring was actually a bit stronger that we would typically expect this time of year." September numbers may reflect what, if any, the effects were from the total solar eclipse or the forest fires, and whether those events were significant. "What I'm curious about is some of the effects that the wildfire smoke perhaps had, so I'm going to be keeping an eye on the transient room numbers that will come out, occupancy rates on our hotels, and just keep an eye on some of the job numbers in the tourist industry and if we saw much of an effect there, and I think it probably made a noticeable impact, but we might not notice that until the September numbers come out." 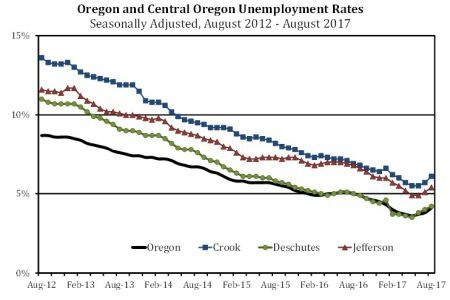 Deschutes County's unemployment rate went up to 4.2% ... Crook County's , to 6.1% ... and Jefferson County's rose to 5.4%. TERREBONNE, OR -- A 23-year-old hiker from Vancouver, Washington died at Smith Rock State Park, Tuesday night. 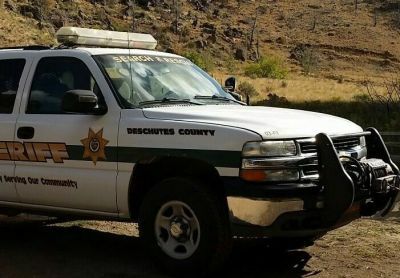 Deschutes County 911 received a report just before 7 p.m. that a hiker had fallen about 250 feet, near Picnic Lunch Wall. Park Rangers, fire crews and Search and Rescue teams responded and found Sebastian Baker at the base of the wall. The Sheriff’s Office says Baker was hiking alone and the cause of the fall appears accidental, although it remains under investigation. Detectives are looking for anyone who may have seen Baker during his hike or witnessed the incident. Witnesses are asked to call DCSO Det. Patterson at 541-693-5911. MADRAS, OR -- The Jefferson County Sheriff’s Office continues to search for a kidnapping suspect, after a raid on a Madras home came up empty. 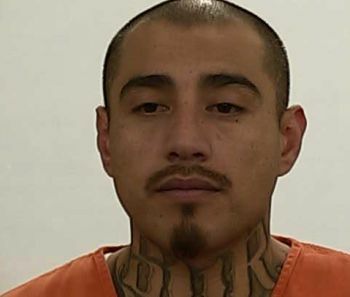 Investigators received information that 37-year-old Omar Benitez was at the house on Madison Street, prompting a search by the Central Oregon Emergency Response Team, Madras P-D and the Sheriff’s Office, Sunday night. But he wasn’t there. Benitez has an outstanding warrant for Kidnapping, Robbery and Unlawful Use of a Weapon. Anyone with information on his whereabouts is encouraged to call Madras Police or JCSO at 541-475-2201 or 541-475-2202. 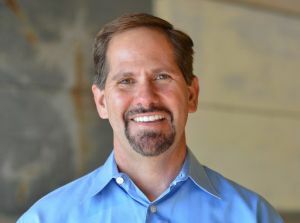 BEND, OR -- Knute Buehler, a gubernatorial contender against current Oregon Governor Kate Brown at the next election, is calling on her administration to join him in compelling former staff from the Oregon Health Authority to appear at a hearing and answer questions about perceived impropriety. Buehler, who spoke to Lars Larson, had this to say about the OHA. "There's been lots of questions that have been brought up since the last legislative session such as over 50,000 people who got health care who weren't eligible, about a smear campaign against their opponents, and an overall lack of transparency that has required many of the major officers of that agency to resign." Buehler has issued a formal request to Governor Brown's office, asking that she join him in demanding the former employees of the OHA appear at Wednesday's legislative inquiry, but has, so far, received no reply. Buehler suggested that Brown may know more than she's said, especially about the charge of a planned smearing of a private company. "It's a really bad precedent to have state-sponsored propaganda, against a private company, and how far did the knowledge of this plan go? Did the Governor's office know about it? Were they involved in drawing up the plan? That's some of the questions I want to ask at the hearing." About his official request submitted to the Governor's office, Buehler said, "So far, we've just been stonewalled, which seems to be the typical way they handle these things...they're going to have current staff, the new staff, and you know what that will be, they'll say 'well, we don't know, we'll have to get back to you'." Buehler told Lars that the documents associated with these improprieties have been heavily redacted, and only the OHA staff, those who resigned as a result of this scandal, can settle the legislation's questions. 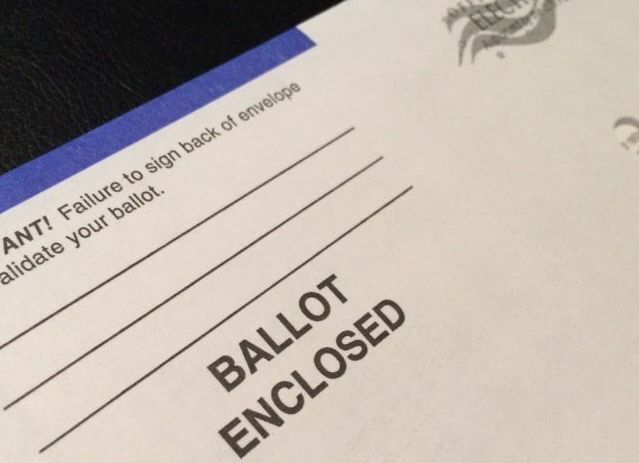 BEND, OR -- There was some voter fraud in Oregon during the last election cycle, but Deschutes County Clerk, Nancy Blankenship, says they seem to be people who voted in more than one state, not voters who got past security. "I think Oregon does a really good job in monitoring and has been very proactive in monitoring our data, in monitoring our voter registration, and those moving between states, and we try and be proactive at that." Blankenship is investigating whether any of the fraudulent votes was cast in Deschutes County, but believes the systems in place work. "I think Oregonians should be very comfortable with the work that the election community does to manage and safeguard the election, the voter registration database, and our elections in general. We take a great deal of care, so there are all these different levels of security that are in place to ensure that only those who should be voting, are voting." The Elections Division has identified 46 votes that appear to be fraudulent, and Blankenship says voter fraud should never be overlooked, so even though that few of ballots is negligible to the individual contests, Oregon is working with other states to investigate. "In the last few years, the state of Oregon has been part of a group that works together to share information. And so, in the last few years, we've been able to identify those who have, apparently, may have voted in two states. Those are the things that they're pursuing." According to Blankenship, Oregon has a 'Trust, but Verify' policy when it comes to voters - they believe the information provided on the registration, and have stringent security measures in place that each ballot must pass in order to be counted. Intentionally voting more than once per election is a felony, and punishable by up to five years in prison and a $125,000 fine. BEND, OR -- Scattered rainfall is helping local wildland fire crews and pushing smoke from the area. But, Jean Nelson Dean, with the Deschutes National Forest, says that doesn’t mean the region’s largest fires are suddenly out. "The significant moisture that we are getting in some of the higher elevation areas we do expect to moderate fire activity and allow us to get a handle on some of these fires. 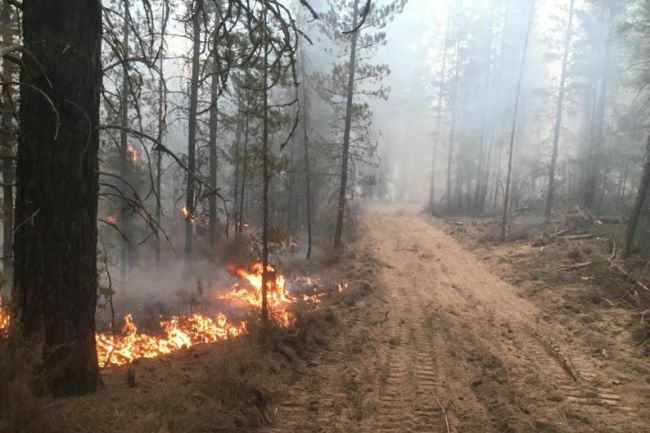 However, if we see what is currently forecast, we see another warming trend following this; we may continue to have fire activity into October," Nelson Dean tells KBND News. "In terms of air quality, this rain is fantastic in clearing it out. And, there’s no question we’re getting enough rain we’re going to be able to get these fires suppressed and keep them probably within where they are now. It would depend on every individual fire and how much moisture each fire gets, but we’re looking here in Central Oregon, particularly with the Nash Fire and the Milli Fire, to have this rain really benefit us." 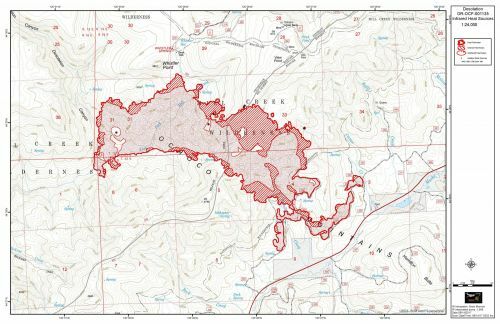 The Milli Fire (mapped above), near Sisters, is now just over 24,000 acres and 60% contained. Whychus Overlook and parking lot reopened Monday, but other area trails and campsites remain closed, as well as Highway 242. 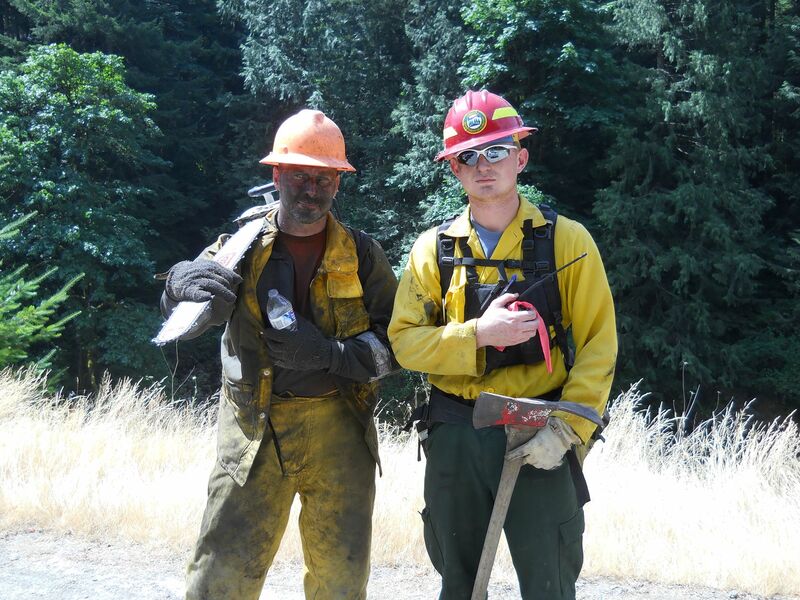 "We continue to patrol and rehab the Milli Fire. It is continuing to burn, with low intensity in some areas. We expect that to carry on until we get actual snow up in some of those areas." The 6,700-acre Nash Fire also continues to burn west of Sisters. "Given that we expect significant rain on that fire, we’re looking at improvements in terms of fire activity; it hasn’t really grown in several days." 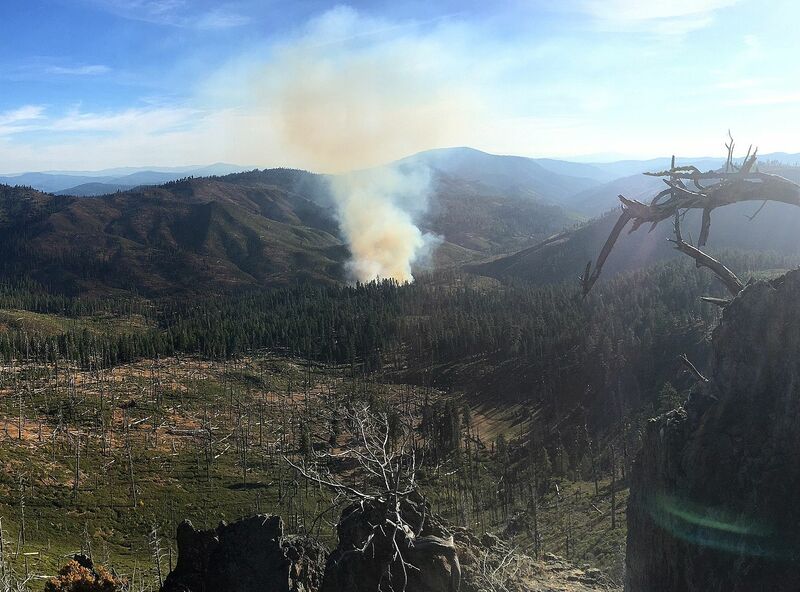 In the Ochoco National Forest, the Desolation Fire also continues to burn. It's grown to about 4,500 acres and is 20% contained. Nelson Dean says Crook County residents may see more smoke from that blaze, as crews conduct burnout operations as weather allows. 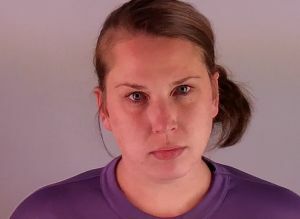 LA PINE, OR -- A 28-year-old La Pine woman was arrested for multiple charges, Monday afternoon, after allegedly leading a Deschutes County deputy on a short police chase. According to the Sheriff’s Office, the deputy observed Sarah Hulgan commit multiple traffic violations near Burgess and Day Road, at about 4:30 p.m. The deputy turned around and attempted to stop the vehicle, but she took off at speeds of about 80 MPH. Hulgan eventually stopped near the intersection of Burgess Road and Century Drive. Hulgan was taken into custody for attempting to elude and driving while suspended. PRINEVILLE, OR -- State Police are asking for the public’s help in finding a suspected poacher. 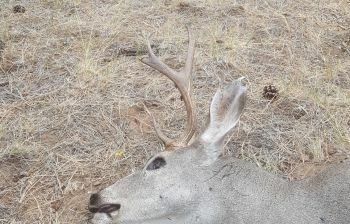 On Saturday, OSP was notified of a dead buck deer north of Prineville, about a mile and a half from McKay Creek. The deer was shot with a rifle during archery season, and a portion of one back-strap was removed, while the rest of the animal was left to waste. Anyone with information is asked to call the OSP Fish and Wildlife Division or the "Turn In Poachers" (TIP) Line at 1-800-452-7888. 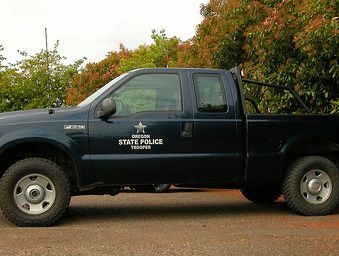 LA PINE, OR -- The vehicle belonging to a missing La Pine man was found near Davis Lake, over the weekend. But, the Deschutes County Sheriff’s Office says there is still no sign of 61-year-old Gary Humbard. Public's help needed in search for missing La Pine Man. Hunters discovered Humbard’s Ford Explorer at a Davis Lake trailhead, near the Klamath County border on Saturday. One of the hunters reported seeing Humbard exit his car with a backpack on September second. He thought it was suspicious the vehicle was still there two weeks later. Search efforts continue in the area, but so far there has been no sign of Humbard or his route. Anyone with information on any sightings or contacts with Gary Humbard on or after September 2, 2017 in the Davis Lake area is asked to call the Sheriff's Office at 541-693-6911. 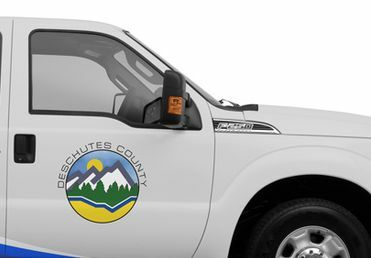 BEND, OR -- Deschutes River Woods residents can expect a visit by county staffers, sometime over the next couple of months. Starting this week, the County Assessor’s office will conduct a regular reappraisal of homes in the area. Appraisers drive county-issued vehicles and will verify property features like the number of rooms, square footage and overall condition of houses. They should have proper identification and business cards. State law requires the Assessor’s Office to ensure property records are accurate. BEND, OR -- Bend streets crews will soon change traffic flows at a northwest Bend intersection. 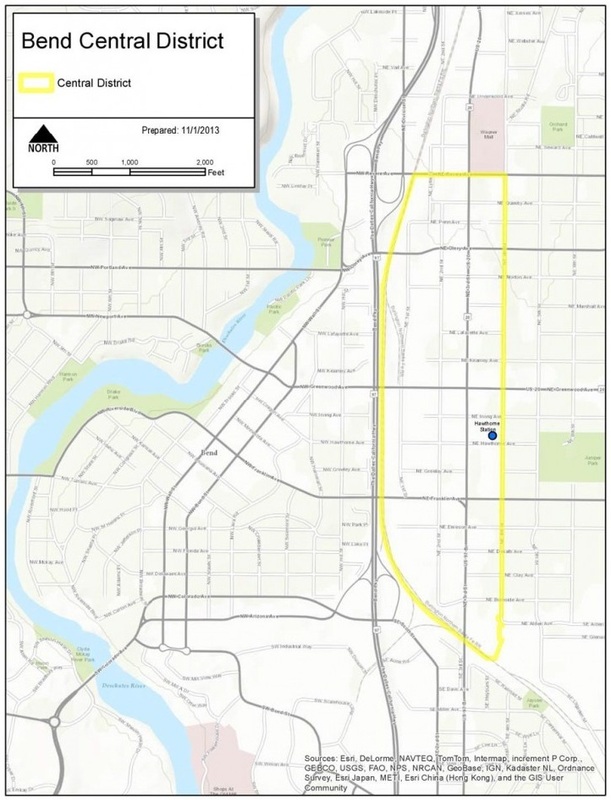 "Stop signs at the intersection of Portland and 11th will be switched so that starting on the 28th of September, traffic on 11th Street, which kind of goes uphill/downhill, will be required to stop; and traffic on Portland Avenue will continue through the intersection without stopping. 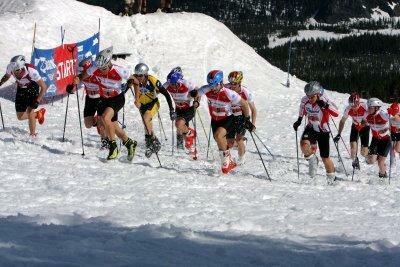 It’s the opposite of that right now," says Anne Aurand, with the with the city of Bend. She tells KBND News the shift is in response to a number of citizen complaints. "There have been some accidents at that intersection." Deschutes County District Attorney John Hummel was involved in a crash at that location, a year ago. "The stop signs were switched because Portland Avenue is a major collector, which means it has higher traffic volumes and it has a bicycle lane. Eleventh Street doesn’t get as much traffic; the volumes don’t meet the threshold for a stop sign or an all-ways stop." She admits, "We don’t really know why they were switched that way. It wasn’t the way it should be." Aurand says the change will take some getting used to by local residents. "Where we used to be able to just keep going; now you have to stop on a hill, and in the wintertime that could be tricky. So, kind of as a result of this change, that block of 11th Street and Portland is going to be added to the winter sanding route." The stop sign change will be implemented by September 28, with additional signage in place for about a month, to notify drivers. REDMOND, OR -- Redmond Proficiency Academy has added new technology to help students learn about distant times and places, without leaving their desks. Ryan McLaughlin, Humanities Teacher at RPA, believes every teacher and every class will benefit from 30 of the virtual reality headsets. "We actually got them on Monday and I used them in my class. 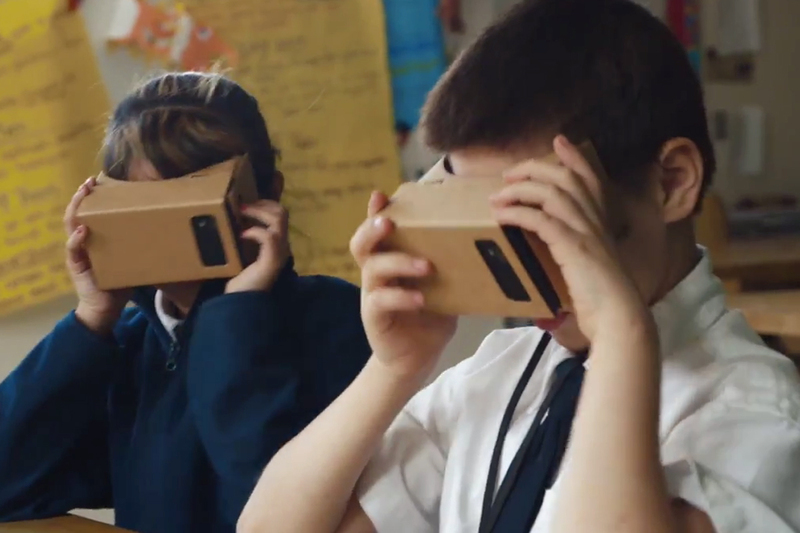 They're put together by Google and they're called Google Expedition, and they let teachers take their kids all over the world." It's innovative and exciting, according to McLaughlin, and he can see myriad applications. "For me, they're amazing. I teach classes like AP Art History, where it's awesome that I can take kids to ancient ruins all over the world, take them to art museums...I was totally on board, right from the beginning." Both the high school and the middle school campuses of Redmond Proficiency Academy have access to the headsets, and McLaughlin says that when he and his fellow educators were training with the new tech, they seemed like a modern version of 'The Magic School Bus.' "The way they're set up right now is you're in an immersive, 360 degree image, and the teacher sets, where all the students are using them, are not interactive in the sense that there's somebody talking to you in a video. I like to think of it as an extremely immersive presentation of places." McLaughlin says the Google expedition headsets are perfect for teaching things that are difficult to grasp from books, like history or biology, and teachers in different disciplines have scheduled times to use the tech in a variety of virtual applications. "I used the headsets on Monday to teach something that can feel a little stuffy - we were talking about the American Revolution and the road that led to it, and I saw students more engaged and thinking about it and why the United States declared its independence in ways that I've never seen before. So, it can really make history come alive and can make complicated ideas captivating." The headsets are set in an immersive mode that allows students to visit places, historical periods, and even biological systems, allowing them to learn familiar subjects in a totally new way. BEND, OR -- Bend city officials kicked off Welcoming Week, Friday. Brad Porterfield, with the Latino Community Association, says it’s about celebrating all types of people, regardless of where they’re from. "We think it’s really important to be proactive and send a message that our community is welcoming, and then do the work to educate and raise awareness about our immigrant and refugee neighbors and what they experience and how we can make our community thrive by embracing them and learning more about their cultures." When City Councilors agreed to become a Welcoming City in June, some citizens worried it was a shift toward becoming a "Sanctuary City." But, Porterfield says the Welcoming City designation doesn’t have anything to do with immigration status. "I think that’s a common misconception, possibly. Sanctuary state and sanctuary city generally means that we’re just not going to use our resources, taken from our taxpayers and our residents, to enforce immigration law because it’s not our job." Oregon law already prohibits the use of state or local resources to enforce federal immigration law. Porterfield says this week’s festivities are about celebrating diversity, not politics. "Welcoming City is emphasizing the fact that immigrants and refugees, in particular, face unique obstacles and barriers to thriving in our communities because of just cultural differences, language differences." He tells KBND News, "Welcoming America, the national organization that the city of Bend is now an affiliate of and our organization is a member of, is nonpartisan. They’re trying to stay away from politics and just focus on the people and the stories; looking at communities, cities in particular, where they are embracing their immigrant and refugee neighbors and businesses, and how those communities are thriving." 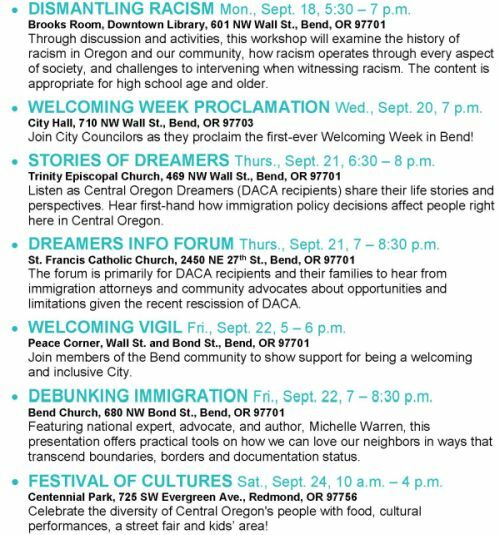 Bend City Councilors will sign a Welcoming Week proclamation at Wednesday's City Council meeting, and the week wraps up with the Latino Community Association’s annual festival of cultures Saturday at Redmond’s Centennial Park. BEND, OR -- For the twenty-second year running, the Eastern Cascades Model Railroad Club is holding their Annual Open House. The Train Club's Bruce Blanford says the event is free to the public and a fun opportunity to be part of the railroading world. "We're inviting the public to come out and enjoy the hobby of model railroading with us. We have our HO layout and the rest of our Club will be working with the 1 1/2" layout where people can get the train rides. We'll have eight or ten trains running - can't tell for sure because we always have visitors coming who add to the number of trains." Blanford, one of the Train Club's charter members, says the Club exists because trains will always spark the imagination and kids should have the opportunity to learn about them in a more manageable size. "There's a group of people that got together, not necessarily worked for the railroad, but they've always be fascinated with trains, and over the years we've grown to the point where we've gotten a group together that really enjoys working on and operating the trains, plus the infrastructure that goes along with it." He says, "The Open House is free to the public, there's no charge, we have lots of parking, and it looks like the weather will be fairly cooperative this weekend, so we hope a number of people will come out and enjoy the hobby of model railroading with us." Blanford says there will be food trucks, like Tennessee Grilled Cheese, and music, and there's always plenty of shade. The event takes place between 10 a-m and 4 p-m at the Train Club property on Modoc Lane off Ward road in SE Bend. PRINEVILLE, OR -- The Oregon Hunters Association, a non-profit group ten-thousand strong, has filed a lawsuit to challenge a decision by the US Forest Service to build 137 miles of Off Highway Vehicle trails in prime elk habitat. The OHA's Conservation Director, Jim Akenson, believes the project would displace the elk from public land, driving them onto private property, causing issues for property owners. " The problem associated with that trail development is the fact that it compromises elk security. And any additional disturbances on that piece of landscape are just going to add to a problem of elk using private land for security and leaving public land, particularly during hunting season." Akenson says the Hunter's Association filed the lawsuit as a last resort, and they hope they can reach a compromise with the Forest Service, but they filed because they're worried about elk security, and the rights of the people who live in the area. "Primarily, this is a seasonal distribution concern. So, basically, in the summertime when these trails are in use, elk have a tendency to avoid motorized vehicles, so they're going to tend to not use that landscape so much, and where they're going to find refuge is in neighboring private land, and that's not very fair to the private landowners." Though they have nothing against the use of ATV's, Akenson says the chapters of the hunters group have opposed the Ochoco Summit Trail Project since it's proposal in 2009. "Frankly, I can see why there would be an interest in that, it's a beautiful piece of property, but our problem is one of cumulative effects. There's already a lot of recreational activity on that forest, that area is close to a big population center and that area is a playground for those communities, so there's already a lot of disturbance of elk, and as hunters, that's our primary concern." Akenson says the Summit Trail is the first to be designed specifically for off-road vehicles, and despite much protest, and ten years of environmental impact studies that show the elk would be adversley affected, the Forest Service is still planning to go forward. 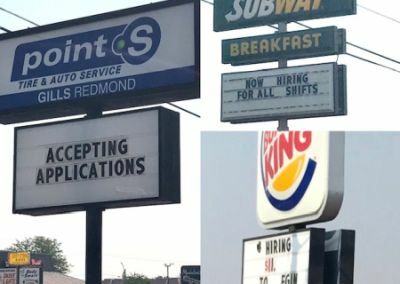 REDMOND, OR -- Oregon’s unemployment rate rose in August, for the first time in seven months; but “help wanted” signs abound in Central Oregon. Jobless claims typically rise in the summer, when students compete for openings alongside people moving into the region. But, this summer was different, and a number of local businesses report they’re still struggling to fill vacancies. William Higgins has three openings at Gills Point S Tire in Redmond – two of the jobs have been posted for three months. He tells KBND News he's having trouble finding applicants who meet basic requirements. "One, they’re willing to work; two, that are willing to work for the wage that’s offered and then can go through passing the background and all the other requirements. The qualified applicants are just not coming through the door or online. You know, you have an applicant that has good experience, great qualifications and then they don’t have a driver’s license." He adds, "I think what it is, is we’re getting applicants that are being rejected everywhere else." The hiring manager at Mike's Fence Center in Bend tells KBND News his company has nearly 10 openings. He's struggled to find workers for the past year, despite offering "good, competitive family wages with benefits." At Gills Point S Tire, Higgins says, "This time last year, when we were trying to fill positions, which we did very easily, I had a surplus of applicants and I got to choose which ones were the best qualified. Going into spring, we decided to hold off [hiring] a little bit. Then, as we went into summer, we needed to start building up the crew and it was like hitting a wall trying to find people." A short drive along South Highway 97 in Redmond reveals a cluster of businesses all looking to hire (pictured). Higgins believes that's compounding the problem, "Someone can go flip burgers for $13 an hour at Burger King, and it’s hard to compete with that." His jobs start at $12-$17 an hour, depending on the position and experience. Central Oregon’s latest jobless numbers are due out early next week. PRINEVILLE, OR -- Evacuation levels have been lowered around the Nash Fire in the Three Sisters Wilderness. The Deschutes County Sheriff's Office reduced notices from Level Two to Level One, for areas around Elk Lake and Hosmer Lake, and the Lava Lake area is no longer under any evacuation warnings. The Nash Fire has burned 6,680 acres and continues to impact travel on Highway 242. In Crook County, the Desolation Fire (pictured) remains 0% contained; it's burned 2,252 acres in the Ochoco National Forest and is still sending smoke into the Prineville area. The blaze stayed within planned containment lines, overnight, and most of the growth has occurred within the Mill Creek Wilderness. The Crook County Sheriff's Office lowered evacuation levels from Two to One, Friday morning. A temporary closure order remains in effect for all of the Mill Creek Wilderness and Forest Service land north of the wilderness up to and including Forest Roads 27, 2730 and 2745. LA PINE, OR -- A La Pine man was hurt during an alleged altercation over a cell phone, Thursday morning, at his home on Dorrance Meadow Road. 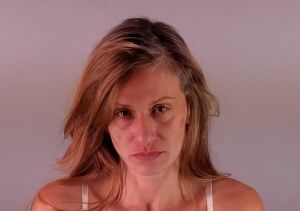 A 40-year-old Florence woman is accused of cutting the victim’s arm with a box knife during the argument. She left the house before law enforcement arrived. Medics treated the 36-year-old man for a 3" cut on his right forearm. BEND, OR -- OSU-Cascades received a $1 million gift, this month, pushing the university closer to its goal of building a second academic facility on the Bend campus.The new building would be focused on the STEAM studies of Science, Technology, Engineering, Arts and Math (architectural rendering above). The donation came from the founder and President of Grace Bio Labs of Bend. OSU-Cascades has now raised nearly $9 million of the $10 million match required for the state bonding proposed for the new building. The school received another $9.5 million from the Legislature and plans to ask for more to fund the new building in the February session. PRINEVILLE, OR -- Strong winds and warm temperatures in the Ochocos pushed the Desolation Fire south out of the wilderness, earlier this week, threatening infrastructure along Highway 26. "It kinda took a little run toward the southeast and toward the Mount Bachelor Academy area," says Lisa Clark, with Central Oregon Interagency Dispatch. Clark says aerial efforts were no longer enough, and firefighters are now working to suppress the blaze. "This was actually a lightning fire, it was burning in heavy fuel, with a lot of downed wood and snags in the area, so fire officials just took the initial strategy of just using air tankers, but after a couple of days when it started to become more active, we brought in ground crews." She told KBND News Wednesday, "Right now, we have about 75 and we've ordered six additional ground crews, so we expect to have about 185 personnel on the line." Highway 26 is still open, but the Oregon Department of Transportation plans to have crews on-hand to help keep traffic flowing and ensure easy access for fire personnel. Nearby residents are urged to be ready to evacuate. Level Two warnings remain in place for the Marks Creek area, and the Forest Service has expanded temporary road, trail and area closures. 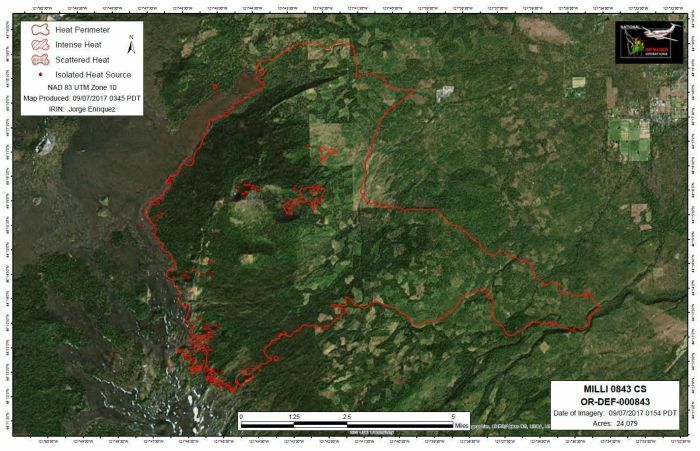 An infrared flight mapped the fire at 1,568 acres, Wednesday night; it's still 0% contained. With more personnel and a shift in the weather predicted, Clark is optimistic. "We're seeing a cooling trend coming in the future. We're hoping by Friday temperatures drop, and we'll be even luckier if we get a little frost at night that will help decrease fire behavior significantly." Smoky conditions will continue Thursday in the vicinity of the fire, along Highway 26 in the Ochoco Divide area. A community meeting will be held Thursday at 5 p.m. at Eastside Church in Prineville (3174 NE Third Street). BEND, OR -- Bend's Oktoberfest kicks off Friday at 3 p.m. It’s the largest fundraiser of the year for the Downtown Bend Business Association. 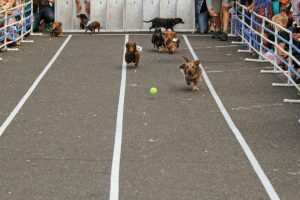 Executive Director Rod Porsche says the annual Wiener Dog races have become so popular, they’ve taken on a life of their own. "People literally have come from as far away as Seattle to have their wiener dogs compete in our races, which are on Saturday. 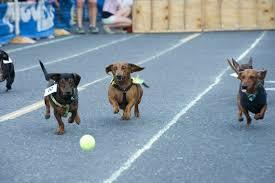 It’s a love/hate thing with the wiener dog races. They bring so many people in. But, man, it’s a challenge to get all those folks into that small space." Due to those anticipated crowds, the races are being moved to Irving and Oregon Ave. "The location just wasn’t working anymore," Porsche tells KBND News. "We had folks dangling off the top floor of the parking garage and it was like, we just can’t have it anymore for insurance and safety; we just didn’t want anyone to get hurt. So what we’ve done is we’ve moved it to Irving and we’ve quadrupled the amount of bleacher seating." And, for the first time, the wiener dogs will be broadcast on a big screen for overflow crowds. "There will be added bonuses because, of course, we do the tricycle races earlier in the day; those are amazing and very entertaining. And, people who aren’t able to get a seat in the bleacher area will be able to see it on this big ‘Jumbotron.’ And then, of course, all the action – the oompah band and the hammerschlagen and all the things we do up at the main stage will be on this big screen, too." 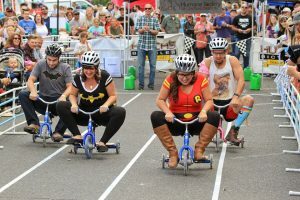 The wiener dog races begin Saturday at 4 p.m.; the adult tricycle race is at the same location at 1:30 p.m. 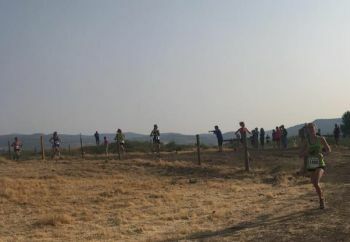 Entry fees for both events benefit the Humane Society of Central Oregon. Oktoberfest takes place downtown from 3 to 10 p.m. Friday and noon to 10 p.m. Saturday. Click HERE for more details. To hear our full conversation with DBBA's Rod Porsche, visit our Podcast Page or click HERE. BEND, OR -- Deschutes County Commissioners have given final approval for an indoor marijuana grow in the Tumalo area. The 42-acre property is zoned for Exclusive Farm Use and several neighbors had appealed the application over concerns the operation would increase traffic on Bill Martin Road. Commissioner Tammy Baney says the applicant satisfied all of the county’s requirements for a marijuana production facility. "I think the challenges to this application by adjacent property owners were more related to issues that were outside of this application. So, while I very much appreciated their input and engagement, I felt that maybe their comments and concerns would be better directed toward a different subject and manner. This actually was not the right path." While Commissioner Phil Henderson Henderson also questioned how safety would be impacted, he agreed it was outside of the applications purview. "I do still remain concerned with the road out there. I don’t know that it effects the decision but I guess that still is a pending problem, I guess, for anybody using the road very much, or for the heavy construction zone." Neighbors filed an appeal in June, shortly after Commissioners granted preliminary approval. A public hearing was held in August. 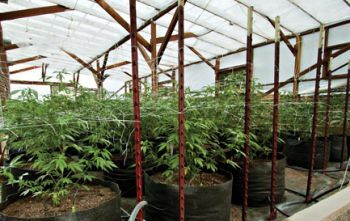 Wednesday's unanimous vote clears the way for marijuana to be grown inside a proposed 5,000 square foot greenhouse and second 3,000 square foot building. REDMOND, OR -- The Redmond Airport will hold a special ceremony to unveil a hand-stitched American Flag quilt. Airport Director Zach Bass says the 100" x 60" quilt had quite a journey from concept to wall art. 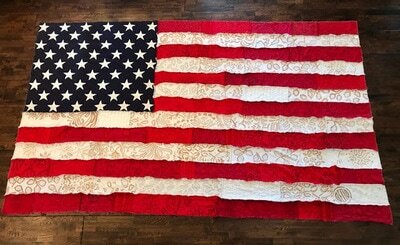 "Eighteen area women decided to put this quilt together and they donated it to the Central Oregon Veterans Ranch for an auction. All the proceeds for the auction went back to the Ranch, and then the individual that won it, donated it to the airport for display." The highest bidder, Debbie Seibert, wanted the quilt to be seen by everyone. Bass tells KBND News, "She told us it had been on display in varying places around Central Oregon and she'd thought about the airport, a central hub for transportation." He adds, "We're just excited to have it and display it for everyone to see. We wanted to, from all of us and as a veteran myself, to thank those ladies and Central Oregon Veterans Ranch for donating it to us." The quilt unveiling takes place at 9:30 a.m. Thursday in the terminal building. BEND, OR -- DACA, or the Dreamer's Act as it's often called, was one topic of the protest that took place in front of a Downtown Bend bank yesterday. Kathy Roche, one of the protest participants, held a sign expressing her desire to see the new Dream Act that's currently before Congress passed, but she's worried. "It's kind of a silly idea to punish children for the acts of their parents, but it's unknown whether Mitch McConnell and Paul Ryan will allow it to come to the floor." Roche says that Immigration should be a topic important to all of us. "Immigration is the responsibility of Congress and DACA was an Executive Order signed by President Obama and Trump has undone that Executive Order, so it's time for Congress to take action and pass the Dream Act." Roche says the Dream Act currently before Congress is available for review on 'Countable' the app designed to connect users directly with Congress to make their voices heard. Roche says the original program should be replaced by a law voted on by Congress, so it can actually help those it's supposed to help. "It will depend upon the language in the final law, if it's passed, and whether they structure it such that it will hold up against a Supreme Court challenge...I'd guess that's part of the Dream Act, I haven't read it all word-for-word." 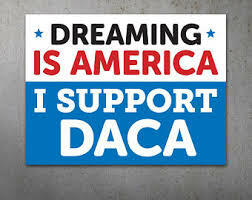 DACA was penned by President Barack Obama in 2012 as an Executive Order, but it has had its own controversy, as it's only a policy and not a law voted on by Congress. In early September, President Donald Trump shut down the DACA Program and tasked the US Congress with drafting a suitable replacement. MADRAS, OR -- the National Transportation Safety Board has released the details of a small airplane crash that occurred near the Madras Municipal Airport just prior to the eclipse. Mark Rich of Menlo Park, CA worked as an engineer for Google and Airbus. He died when his plane collided with a canyon wall on his final approach to the airport on the afternoon of August 19. Rich had planned to camp at the airport and participate at Solarfest. The NTSB reports that a Madras airport controller working the tower during the time of the crash said Rich arrived on schedule and his final approach was modified. A plume of smoke was observed in the canyon shortly after Rich was cleared to land, approximately one nautical mile from the airport. The NTSB report does not list a cause for the crash. To read the official National Transportation Safety Board report on the crash in its entirety, click HERE. PRINEVILLE, OR -- A Level Two evacuation notice was issued Tuesday night for areas around Marks Creek and Mt. Bachelor Academy, in Crook County, due to the Desolation Fire. Level two means residents need to "be set" to leave. 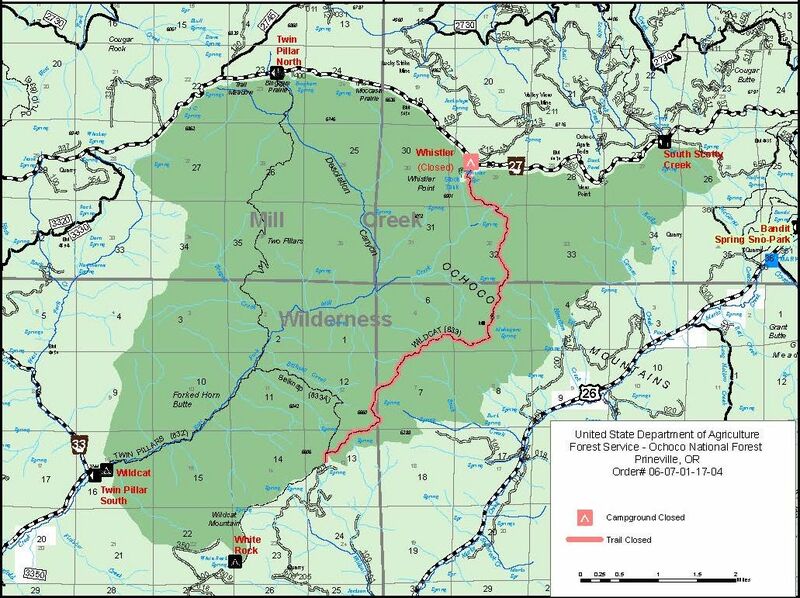 The Ochoco National Forest also issued a temporary closure order for a hiking trail and campground in the Mill Creek Wilderness. It prohibits public use of Wildcat Trail #833 and Whistler Campground until the area is deemed safe. Click HERE for more details. The Desolation Fire was first spotted Saturday; as of Tuesday night it was estimated at about 300 acres. 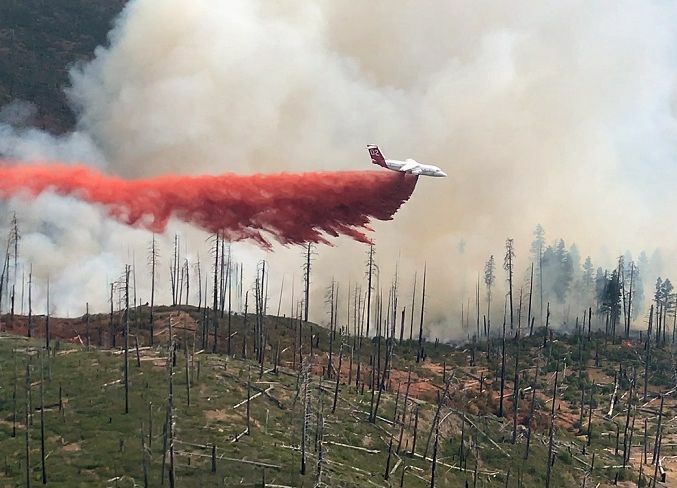 Over the last couple of days, air tankers dropped seven loads of retardant, in an effort to confine and contain the blaze. Those lines were also reinforced with water drops from aircraft. Cave and eventually burned more than 1,200 acres. Oregon State Police Captain Bill Fugate says 37-year-old Christopher Wilson was arrested in Malheur County, last week. "We recovered evidence at the scene; then also, there was at least one witness that observed him and the vehicle leaving the area of the fire. Through investigation, we determined who he was and we knew that he had left the state. We conducted surveillance on him and as he entered Oregon on I-84, into Ontario from Idaho, our troopers stopped him and he was arrested for driving a stolen vehicle." 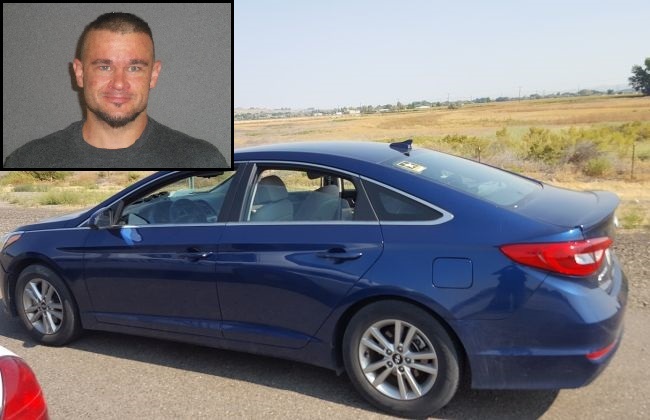 It's the same Hyundai Sonata with California plates that he allegedly was driving when the fires started, "The witness observed that blue car leaving the area very rapidly. And they were fortunately able to get a license plate and description of that vehicle and driver." Wilson is expected to be brought back to Deschutes County, soon "He’s been indicted by a Deschutes County Grand Jury on several counts of arson and reckless endangerment," says Capt. Fugate. "And, he’ll be facing arraignment shortly in Deschutes County Circuit Court." 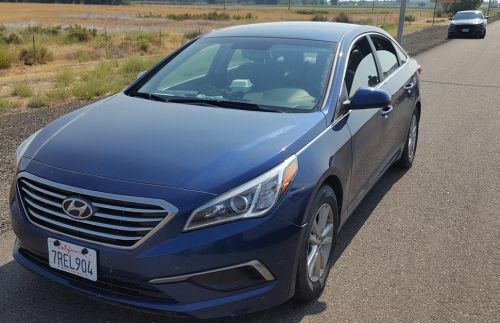 Investigators suspect Wilson may be connected to other fires, "We’re asking the public if they happened to see a 2016 blue Hyundai sedan with a ‘Go Army’ sticker in the back, or saw our suspect anywhere, to let us know. We’re trying to establish a timeline of kind of where he was at in Oregon." Capt. Fugate adds, "We know he may have been on the west side of Oregon, also. So, there’s potential he may have started other fires, or attempted to start other fires." BEND, OR -- This is National Suicide Awareness week, the goal of which is to find new behaviors to work toward preventing suicide. David Visiko, Suicide Prevention Coordinator for Deschutes County, says early recognition of warning signs and intervention can save lives. "How do we create healthy systems for people at risk so, wherever they access in their system of care, that they're getting the appropriate care that's credible and with well-trained people who then can provide them the resources that they need to get help for themselves and then thrive in this lifetime?" Central Oregon is holding events over the next few days to educate, and to support suicide survivors, and Visiko says people need to learn not to be afraid to discuss suicide with those they believe to be in need. "It's not a matter that if someone says the word 'suicide,' they're going to take this idea that's new to them and run. It's that they've already thought about, maybe even a plan, or had the thought come up, so when they're talking about it, they're maybe looking for someone to assist them further to get the resources that they want and need, or to be safe at that time." 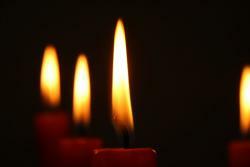 In addition to prevention training and an education series, there will be a Candlelight Vigil on Wall street Thursday at 7 p.m. and the "Out of the Darkness" community walk is scheduled for 9:30 a.m Saturday, at Pilot Butte State Park. 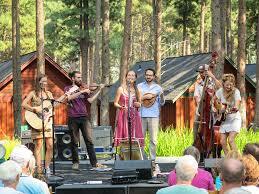 Click HERE for more details on Deschutes County events. Visiko says one of the goals of this week is to get the topic of suicide out of the taboo realm in order to have an impact on this issue. "We need to get this topic of suicide into the open more and break some of those barriers that keep these kinds of conversations hidden. So, the more openly we can talk about behavioral health, mental health, and suicide, the more we're going to get people the help they deserve within our community resource system." If you or someone you know is contemplating suicide, please call to get help. The 24-hour local helpline is 541-322-7500 x9, or the national line with links to Central Oregon is 1-800-273-TALK. Approximately 29 people in Deschutes County die by suicide each year. BEND, OR -- Secretary of State Dennis Richardson was willing to comply with the recent Presidential Advisory Commission On Election Integrity issued to all the States by the Trump Administration, but unwilling to share information that could compromise individual privacy. Secretary Richardson told KBND News. "The Federal requirement for information on Oregon voters said, 'We would like to have whatever information you legally can disclose and that you give to anybody else,' and they've committed to us that personal information will not be disclosed, so we just complied with the law while protecting the privacy of Oregon voters." Richardson says in this uncertain world, it's an imperative for him that he does his job right. "I can't deal with the things I can't control, but as Secretary of State, I can make sure that whatever's under my supervision, is handled in a way that protects the rights and privacy of the people." Secretary Richardson says due to his research on privacy disclosures as he complied with this federal request, Oregon's legislature is taking a second look at what should be available to political parties and the public. He also says that our paper ballots actually keep our information more private than that of voters in many other states. "Voter fraud in Oregon is very difficult to accomplish because you can't hack paper ballots, it's all done without the Internet involved. The first time the Internet is used is when they're actually turning in the count on the various races on election night. So, we've got a tabulation system that's worthy of emulation by other states." Richardson says he waited to comply with the order until he knew that there would be no privacy concerns. "The law says that as long as you don't use it for commercial uses, then you have a right to have it as part of public transparency. And so, I'm complying with the law, but also making sure that we don't disclose too much because of the ability computers have now to do digital analytics and so forth now, and so we have actually given out less than what was previously given out by other Secretaries of State." The President's Advisory Commission is collecting information from each state in an attempt to compile statistics on alleged Voter Fraud. SISTERS, OR -- The Sisters economy relies heavily on tourist dollars, but this summer has been tough for businesses in the small town. City Manager Brant Kucera tells KBND News, "The eclipse and then the fires have definitely had a negative impact on business. And then, of course, with Labor Day weekend and the cancelation of the Folk Festival, it’s been a rough August/September." Kucera says last month's eclipse failed to bring the economic boost city leaders were hoping for, "We benefited from hotel stays. However, a lot of people really went to areas where the length of the totality was much longer, like Madras. It might’ve been good for one sector, but for others, it really wasn’t." Poor air quality over the last month also appears to be keeping visitors away. "It’s not unusual to have smoky conditions. This differs, in that the fires were earlier." Kucera says in the past, large fires struck later in the season and didn’t interfere with large events like the Folk Festival, which was canceled last weekend due to the hazardous air. He calls it a perfect storm of smoke from local fires and others burning across the west, which compounded the problem, "A number of factors all coming together at the wrong time really made conditions unpredictable." City Councilors have tried to encourage people to visit, despite the conditions. "Number one, I think that Council obviously always wants to do whatever it can for the businesses and its citizens in Sisters. That being said, there are obviously a lot of things outside of our control. We do fund our Chamber and the Chamber has done a significant amount of additional advertising to make sure people know that we’re open." As smoke clears out, he says it’s possible the area could recoup some of the lost revenue. "I think that if we have a more mild fall, there’s some chance of at least some more tourists coming. But, we’re going to have to do an assessment of how bad August and September really were." Kucera and Mayor Chuck Ryan plan to meet Tuesday with the representatives from the Sisters Chamber of Commerce to discuss this summer’s unique tourist season and whether any more can be done before the weather turns cold. PRINEVILLE, OR -- A new wildfire spotted Saturday in the Ochocos is sending smoke into Prineville. The Desolation Fire has burned over 150 acres about 20 miles northeast of Prineville. The fire is burning in patches of dead and live timber on steep slopes just below Whistler Point. Planes are dumping water on the blaze near Desolation Canyon; no firefighters are on the ground yet, due to safety concerns. Fire managers plan to use containment lines prepared during last month's Belknap fire to protect nearby private property and infrastructure. Cooler weather forecast for this week could bring wind gusts up to 20 miles per hour, and forestry officials worry existing fires will grow. LA PINE, OR -- The Deschutes County Sheriff’s Office is searching for a 61-year-old La Pine man reported missing Sunday. Gary Humbard’s family grew worried when he failed to return phone calls. Deputies searched his home and neighborhood, but found no sign of him or his SUV. 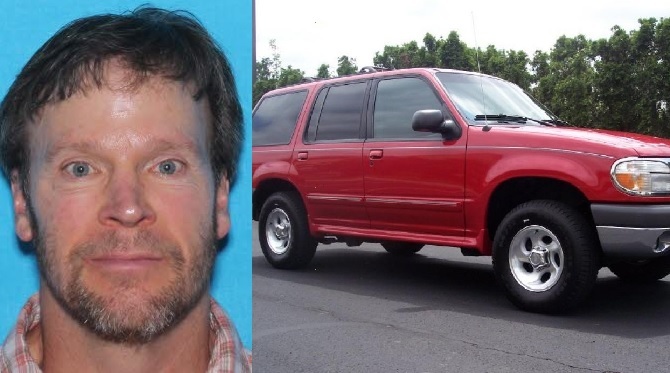 Humbard is 5'10", 180-pounds and could be driving a 1999 maroon Ford Explorer with Oregon plates WZX 682. He suffers from medical issues that may prevent him from walking or driving for long periods of time. Based on the investigation, the Sheriff's office believes he may be a danger to himself, They ask anyone with information in the case to call 911. Submissions will be accepted through Friday, September 15. Click HERE for details on the calendar and how to submit a photo. BEND, OR -- Having waited nearly 40 years for the opportunity to sponsor Bend's Pole, Pedal, Paddle, SELCO Community Credit Union signs a multi-year contract with the Mt. Bachelor Sports Education Foundation. Molly Cogswell-Kelley of MBSEF says, while it was difficult to see US bank go after such a long partnership, she couldn't be happier to be working with locally-based SELCO. "We're really excited and I think that just being associated with such a positive event, and such a community event, is going to be a really good thing for SELCO and for us and for the community." Cogswell-Kelley says Mt. Bachelor Sports Education Foundation wants to make sure people know the Pole, Pedal, Paddle isn't about the athletes, it's about the community, and SELCO understands and embraces that vision, as well, so she believes the new partnership is going to be beneficial for everyone involved, and she's looking forward to working together. "They have a lot of employees who can spread the good will of the PPP, and it's just, what's kind of exciting for us, is that it's nice to have a partner that understands the impact of the PPP to the community." US Bank, in a surprise move, ended their nearly forty-year partnership with Mt Bachelor to sponsor the Pole, Pedal, Paddle last month, but Cogswell-Kelly says that while US Bank has been an excellent sponsor for the last 39 years, she's looking forward to working SELCO. "It's a really nice fit to have such a big commitment, but know that they truly understand the impact of the event for the community and for our non-profit organization. So, I don't think it could be any better." The Pole, Pedal, Paddle takes place every year in May. 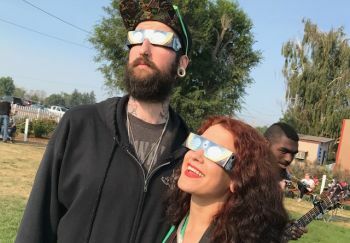 MADRAS, OR -- Even though the City of Madras saw as many visitors as expected during last month's eclipse, it didn't translate into high dollars, like they'd thought it would. Joe Krenowicz, Executive Director of the Madras Chamber of Commerce says, the town still considers the entire experience a 'win.' "Not as large of an economic impact as we all anticipated, but for long term, we'll be seeing two and three and five years down the road, people came to Madras and they hope they'll be able to come back and enjoy our rivers and lakes and certainly our outdoor recreation from cycling and to hiking and we're looking forward to having them coming back. If I had an opportunity to do this again, I'd jump on it right away." Even though the business owners didn't make as much as they'd expected, Krenowicz says nothing was spoiled or wasted, showing that their preparedness and planning really worked. He says the visitors enjoyed Madras, but isntead of shopping and eating out, they came prepared. "They didn't really go into town or drive about town until probably Sunday or Monday. They pretty well stayed in all the 20, 30 locations we had around the area. And they came in prepared with their food and water, and so we did not get the influx that we'd anticipated starting Thursday that we truly wanted to happen." Krenowicz says the Eclipse didn't seem to be about shopping, but was instead a chance to make new friends. "Saw a lot of people, they were able to meet with people from all over the world and the United States, and they made a party where they stayed, at an RV Park, or a tent, or certainly in the hotels we have here in town." Even though things didn't go exactly as planned, Krenowicz believes the city of Madras came out ahead, both financially, and in repeat tourism dollars over the next few years as eclipse viewers plan to return to the area. 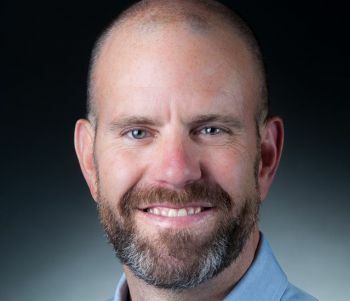 BEND, OR -- The Boys and Girls Clubs of Bend has a new Executive Director. Amanda Gow says when the previous Boys and Girls Clubs Director, Derek Beauvais called her to consider the post, she jumped at the chance. "It's just something that's a perfect fit for me and my background at work, but also with my passion for young people in Central Oregon, and I just thought it was an opportunity I could not pass up and I was so fortunate to be considered for it." Formerly, Gow was Director of Community Programs at J Bar J Youth Services in Bend and overseer of both Big Brothers Big Sisters and the Cascade Youth and Family Center. 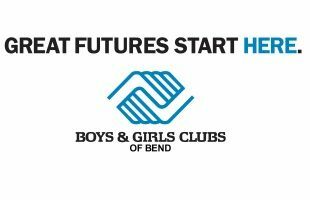 As a child, Gow utilized the programs offered by the Boys and Girls Clubs of Bend and finds it fitting to now be part of advocating on behalf of Central Oregon's children. "I grew up here in Central Oregon, I grew up needing the services the Boys and Girls Clubs provides, so to now be able to run that program and be able to offer that to other young people in our community who need these services, need that support and the programs we offer. It's a true honor to be able to do something like that. I have dedicated my life to helping young people, so really it was just a natural transition to continue to do work with young people here in Central Oregon." Gow isn't planning any major changes and she is looking forward to working as a community liaison, educating Central Oregon about the programs Boys and Girls Clubs offers and ensuring they serve every child who needs them. "My goals are just to continue to support the programs that we have, to ensure that they are the highest of quality and that we are reaching every child that needs us, and then to really be the community liaison to let the community know what we're doing and how they can be involved, and opportunities to support the Club." Gow's first day was September 6, 2017. SISTERS, OR -- Local State Police Fish and Wildlife troopers are looking into a suspected poaching case, and a reward is being offered for information leading to an arrest and conviction. Earlier this month, a buck deer was found near a residential area off Brooks Camp Road in Sisters. The animal had been shot with an arrow, beheaded and left to waste. The report came in September second, but investigators believe it was dumped on or around the late evening, September first. The Oregon Hunters Association Turn-In-Poacher (TIP) program is offering a $500 reward for information in the case. Contact the TIP Hotline 24/7 at 1-800-452-7888 or email TIP@state.or.us. 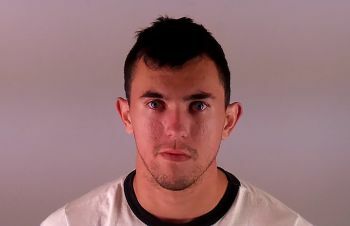 BEND, OR -- Bend Police arrested a 34-year-old man, last week, for luring a girl through social media. According to investigators, Roger Vanwormer sent sexually explicit messages to the 15-year-old Bend victim. The suspect initially tried to run from officers who showed up to search his Linnea Drive apartment, Wednesday afternoon. He was arrested after a police K9 found him hiding under a neighboring deck. He’s charged with luring, escape, interfering with a police officer and a felony probation violation. Bend Police reminds parents to monitor their children's social media accounts and have conversations regarding dangers "that are inherent with youth using social media." In this case, they say the girl was open with her parents and started the conversation early, after receiving the disturbing information. 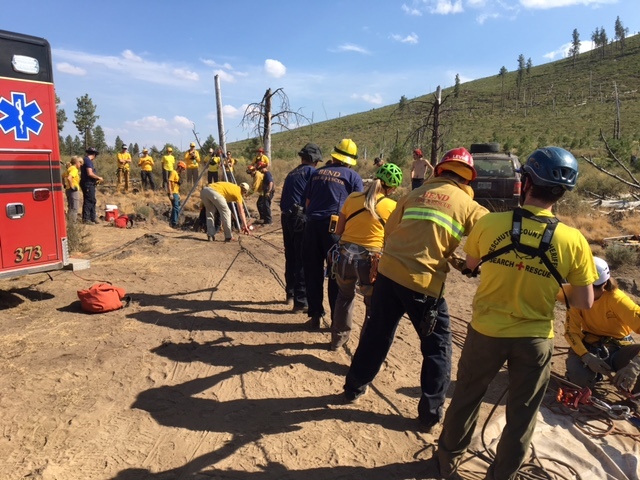 BEND, OR -- A Bend man was hurt while trying to get out of Bessie Butte Cave, near China Hat Road, Saturday afternoon. 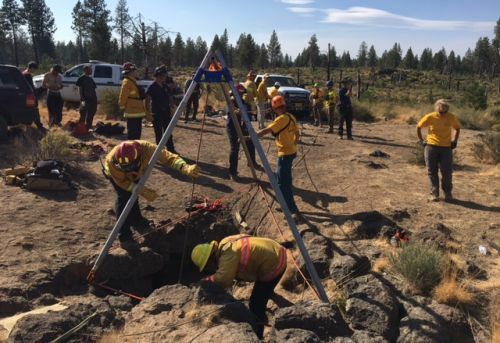 Bend Firefighters and Deschutes County Sheriff’s deputies set up a technical rescue to bring the man out of the cave through a 30-foot vertical section. Officials say Tyrell Bailey and his climbing partners had limited experience and lacked the proper gear for the cave. Bailey was taken by medics to the hospital with non-life threatening injuries. BEND, OR -- Between the floods and fires sweeping America right now, there are plenty of people in need, but scammers feed on the naive in times of tragedy. Steven Mayer of the Better Business Bureau and BBB Wise Giving Alliance, suggests that donors ensure they know where their money is going, not just fund any charity with a good story. "If you're looking to donate, we really want people to make sure they vet the groups, the charities, the foundations they're donating to. So, instead of pouring over tax documents and doing all this research on your own, we've done it for you, just go to Give.org and there you can type in the name of the group you want to give to, or find suggestions of ones if you don't have any picked out already. And we've already done all the work to make sure your money is actually going to those in need." Mayer says there are so many easy ways to give - crowd funding and donation buttons on social media - but it can be difficult to properly vet a charitable organization and be sure it's not a scam. "Even some crowd-funding sites can be a bit unscrupulous at this point, so really give directly to those approved organizations. We're really encouraging people to give to groups that are already there, already set up, they have boots on the ground, they have volunteers out there, helping people get out of the affected areas, getting them the food, and water, and shelter that they need." Give.org has a list of twenty reputable charities for your donations and has been designed to help you know which are the right charities to choose that will do the most good with your money. Mayer suggests that if a charity you've been approached by isn't on the Give.org list, they might be a scam. "Scammers, they've set up fake donation pages, so if you are going to be donating through crowd-funding, you want to know exactly what your money is going to be spent on. We still encourage people to stick to crowd-funding sites that they know the person directly who set that up, so you can trust that person, cuz it's so easy these days to set up a fake site and just scam people out of their money." Mayer also suggests another way to foil scammers is by waiting a few months to donate when the furor dies down, but the need is still there. BEND, OR -- The Bethlehem Inn, the largest homeless shelter in this region, broke ground yesterday on Phase One of their new construction, and thanked local supporters who have contributed more than $5 Million dollars to make the project a reality. Gwenn Wysling, Executive Director of the Bethlehem Inn, says this was truly a momentous day and an amazing milestone for the Inn. "This is a building where thousands of lives will change from crisis and confusion to hope and promise. And this is something that is made possible through the collective efforts of our community to help transform lives through shelter, help, and hope." The shelter has been working out of temporary trailers since the demo of the lobby and kitchen part of their old motor inn occurred last June, and will continue to do so during construction to ensure there is no interruption of services. The Bethlehem Inn has long been housed in the old motel on Third Street and needs replacement in order to better serve. Special guest, Commissioner Tammy Baney, said that government is not the solution to the problem, it is community support that makes things better. "We all benefit from the love and support and the generosity of our community. We will not end homelessness overnight, but it is through each one of the dedicated steps forward, such as we're celebrating today, that we can make that change. And 'Transforming Lives' is the perfect name for this ... to be able to share that vision, and to be there for individuals and families who need us." Phase One - the 18,600 square foot family residence and service hub - starts now, but Phase Two is in the design stage, and its goal is to increase the number of units to house single men and women. Heather Tennant-Salveson, 'Transforming Lives' Capital Campaign Chair for the Inn, said the residents are what inspires her - their bravery in overcoming the crisis of homelessness is a beacon of hope to our community. "These old buildings can't last forever, in fact, they've lasted a lot longer than they were expected to, and the truth of the matter is that, if we do not replace these buildings, and soon, Bethlehem Inn, itself, will be homeless, and that's unacceptable, when the need is so great." Construction of Phase One starts today and the entire project will hopefully be completed by 2020. SISTERS, OR -- The Sisters Folk Festival, which was scheduled to begin tomorrow, has been canceled for the first time in the Festival's history. Folk Festival Board member Jack McGowan says given the atmosphere, there was just no way to overcome the obstacles and keep the Festival on. "We really had to look at the safety concerns that really were ongoing day after day. Everyone in Central Oregon, in fact everyone in the Pacific Northwest, knows that this is unprecedented. We have never had this type of smoke, in such a broad area, in recent history." In the next few days, the Festival Committee will meet again to determine what they can offer in lieu of the Festival or how to go about refunding ticket sales, but McGowan emphasizes that even though they had to cancel this year, they'll be back next September. McGowan says, "The proximity of Sisters to the Milli Fire, and to other fires, really forced us to make this really tough decision. We had days of intensive conversation with fire managers, meterologists, even health professionals, and we just realized that we could not do this. We gave this thing our very best shot." He continues, "This is a real blow to Sisters, there's no question about it. It's an economic blow, it's been a tough, tough year for our town. First with the major snows, and now with the fires that have plagued all of the Northwest, but we really felt that for the good of the community, it was really a decision that we came to, regretting it, but really understanding that it was the right decision to make." There is a red flag warning in effect for Sisters right now, and due to the smoke, McGowan says the committee realized they couldn't in good conscience expose visitors to the hazardous air of the outdoor venue. BEND, OR -- Two weekends from now, there are several events happening in Central Oregon - like the Bend Oktoberfest. Rod Porsche of the Downtown Bend Business Association, says if the smoky conditions don't improve, he worries people will stay away. "We are monitoring it and no doubt, Labor Day numbers were lower in terms of visitor traffic, and we're so dependent on visitors in Downtown Bend with our restaurants and retail and we certainly hope it's cleared up by a week from Friday." The Bend Oktoberfest is Downtown Bend Business Association's largest fundraiser where 100% of the proceeds goes to beautification efforts like daily sidewalk sweeping and the flower baskets. Porsche says he's concerned, because during Labor Day weekend visitor events, the numbers seemed quite a lot lower. "I suspect that a lot of our visitor traffic was off. i think when the numbers come in through VIsit Bend, we'll see that there was a dip because of the smoke and will be for the foreseeable future." Oktoberfest promises to be even more fun this year with their new location on Irving, and Porsche hopes the smoke clears so everyone can come out and have a great time. BEND, OR -- With 33 large fires burning in Oregon right now, the cost of suppression keeps going up. Northwest interagency Coordination Center's Robin DeMario says each fire is different, depending on the topography, severity, and suppression efforts, but the price tag, so far, is over twice as high as last year's. "To date, for the fires that are burning in the State of Oregon, and these are the large fires, not the little small ones, but the large fires that we estimate the cost of suppressing these fires is $214 Million and the total of acres that have been affected by fires in Oregon, it is 431,879." Our 33 large fires, defined as affecting over 100 acres of timber or 300+ acres of grass, are burning right now, and DeMario says year-to-year can't really be compared, and it's impossible to determine what each of the over 431,000 acres currently ablaze has cost so far. "A fire, say in the wilderness area, where there are no threats to structures or other established resources or communities, we wouldn't be flying those resources on that, whereas we would if it was threatening a community and other infrastructure." DeMario says that as these fires grow and the smoke thickens, visibility lessens, which means it's that much more difficult to engage in suppression efforts and that Oregon has burned over twice as many acres as last year, putting us on course to catch up with 2015. 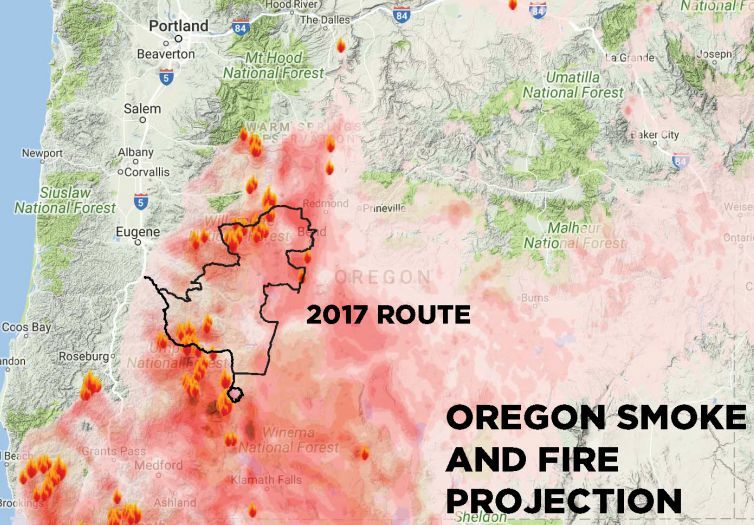 "Last year was a slow year, but if you go back to 2015, Oregon's total acres burned was 604,000." To put the differences in the years in perspective, DeMario clarified, "In Oregon, last year, there was approximately 190,000 acres burned. The ChetCo Bar fire is estimated at 176,000 acres." DeMario says while the weather plays the biggest role in the number of fires set every year, with conditions as dry as we've seen this summer, humans need to be vigilant about caring for the forest. BEND, OR - -These smoky conditions could lead to emergencies, but right now, Life-Flight can't rescue everyone who calls. 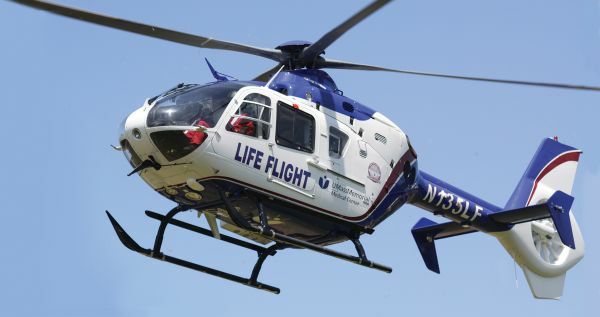 Life-Flight's Justin Dillingham says lack of visibility is making it unsafe for personnel to attend each cry for help. "The weather is impacting our operations, and we have had to decline a number of requests throughout the entire region, throughout the state due to the smoke, but when the requests come in, we evaluate each one individually, and fortunately, we have been able to help people during the smoky conditions." Dillingham says Life-flight is working closely with ground EMS to make sure those who need transport to area hospitals are helped, and he also says helicopters aren't the only option for rescue operations. "We do use our fixed-wing, our airplane, when the helicopter's not able to fly, if we can get to an airport nearby or if it's from one hospital to another, so that does help us, but there are times that even the airplane can't be used because the smoke is so dense." According to Dillingham, personnel are having to evaluate each help request that comes in against the atmospheric conditions before deciding if they can fly to the rescue. "We have to make sure that it's both safe and legal for us to accept a flight to be able to help someone, there are certain minimum requirements from the FAA for visibility, we have to be able to see where we're going, and in instances where it's not legal, we would rely on the ground responders to help." LifeFlight is still actively rescuing as many as they safely can. In Central Oregon, they rescue, on average, one person per day. BEND, OR -- Bend-La Pine Schools plans to launch two new “small high school” options next fall, similar to a charter or magnet school model. Assistant Superintendent Lora Nordquist tells KBND News the idea came from a desire to balance enrollment at existing schools and create new options for students looking for alternatives to traditional high schools. 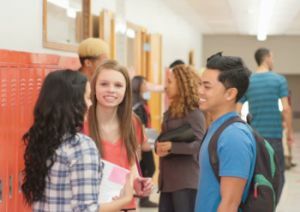 "When you talk about a charter school or a magnet school, we usually think about those as ‘schools of choice’ that have a particular programming model or focus, and they definitely fit in that category of a school with a very focused intent." She adds, "We envision a school that would probably grow no larger than about 400 or 500 students." The new options don’t take the place of a new high school, funded by last year’s bond measure. "There will still be a fourth large building designed to accommodate between 1500 and 1700 students." She acknowledges the new programs won't be right for everyone, "We look at these small high school options as not having the complete range of programming that you’d see in neighborhood high school - So, all the sports and co-curricular activities. They would definitely have electives, but they’ll be very specialized in terms of what is the focus of the school." And, Nordquist says there are still details to work out before the new programs can begin in September 2018, but things are moving quickly. "I’ve met with almost 500 people in a series of focus groups, this spring, and people are very excited about this idea. They think it’ll be great for kids." Community meetings are scheduled for next week, to discuss the three options. The first meeting is scheduled for 5 p.m. Monday, September 11 at Bend Senior High. Click HERE for more details on the plan and meeting schedule. PRINEVILLE, OR -- The Crook County Court voted today to approve a contract to review the County's new Natural Resources Plan with a Wyoming law firm. An opposition group was expected to attend this morning's meeting, not to oppose the plan itself, but the lawyer tapped to review the plan, because of her ties to Nevada Rancher Cliven Bundy. Karen Budd-Falen is an expert on federal land use statutes, and she admits she represented Bundy as part of a group - not personally. "25 or 26 years ago, the BLM issued a full force and effect decision telling all these ranchers they had to remove their cattle because the desert tortoise got listed as a threatened or endangered species, and that was when he was paying his grazing fees and he believed that the federal government had jurisdiction over the property." Budd-Falen says it is her expertise in Federal Law that is behind Crook County's contract with her, and she also believes other counties across the state will draft similar Natural Resource Plans and contact her for her help. She says it's incorrect to call her 'the Bundy family attorney' as she has been portrayed, as she has only had minor contact with them. "I represented him 26 years ago, he had one of the grazing allotments in Nevada, and so he was one of that group of ranchers that I represented and we went to court to keep the BLM from kicking the cattle off of the property. And then Cliven decided that he believed the County had jurisdiction over the land and all that other stuff and then I quit representing him." Crook County Judge Seth Crawford declined our invitation to comment on the controversy. 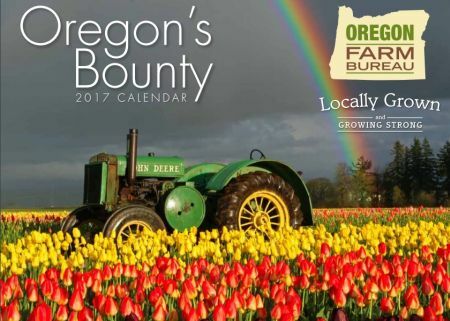 BEND, OR -- Central Oregon Locavore, a Bend non-profit marketplace with only locally-grown or produced foods, raised the $25,000 they needed to keep their doors open. Megan French of Locavore, says it wouldn't have been possible without tremendous community support. "We were really excited and overwhelmed by the [amount] of people who donated to our Go-Fund-Me, and small businesses around town stepped up and did donations days for us. The store was busier than ever, we had a flush of new memberships, so, it was kinda like every little bit added up to this great amount, so we're really happy and really grateful to our community." French says they raised the funds in fewer than two months and she credits Central Oregonians who know how important eating local is, and how vital it is to support area food producers. "We just want everyone to know that we're extremely grateful for the outpour of support, whether it's financial or verbal, we had lots of people come to us with great ideas, and we're just extremely grateful and happy to be able to continue serving the community and the local food system." Central Oregon Locavore has been integral in connecting local chefs with farmers in an effort to create a farm-to-table community. They plan to celebrate the meeting of their goal by throwing a Fall Harvest Feast on September 16th at DD Ranch in Terrebonne. BEND, OR -- This year’s fire season has been devastating, and it’s not over yet. Jean Nelson-Dean, with the Deschutes National Forest, says we’re only halfway through the season. "Throughout Oregon and Washington, we have 28 what we call large fires – those are primarily fires that are over 100 acres in timber. And, when you look at that, a lot of those fires that we’re categorizing are actually what we call complexes, so there are several small fires within each one of those 28." While the total impact of the year’s devastating fires isn’t yet known, Nelson-Dean tells KBND News the Redmond Air Center has already used a massive amount of fire retardant. "We’re not even through the fire season, and we’ve exceeded our 10-year average by about 400,000 gallons, which is quite a bit of retardant; and we still have at least half the fire season left to go." She says the season has been so tough because of the wet winter and spring, which led to a large crop of grass and other fuels. "It’s really the severe drying; that’s the real issue. We’ve gone without any kind of moisture for a long time, and these high temperature in August, they take all the moisture that we got built up in our large fuels; they’ve already sucked it out and we still have September. And, some of our largest fires have actually occurred in September, so it’s not over yet." Aside from a trace of moisture in mid-August, Central Oregon hasn’t seen any measurable precipitation in about three months. "Probably every firefighter out there is desperate for rain. Every person managing these fires, every evacuee, every person who has asthma, their kids have asthma, they’re praying for rain. I wish there was some way that we could really get some significant moisture. Certainly we’re going to get our arms around some of these fires, but to really end the season, we need some significant moisture." She admits it could be early October before the region gets enough rain to bring an end to this fire season. Click HERE for our full conversation with Jean Nelson Dean, or visit our Podcast Page. PRINEVILLE, OR -- Prineville City Councilor Jack Seley stepped down, late last week, creating a vacancy remaining Councilors will need to fill. 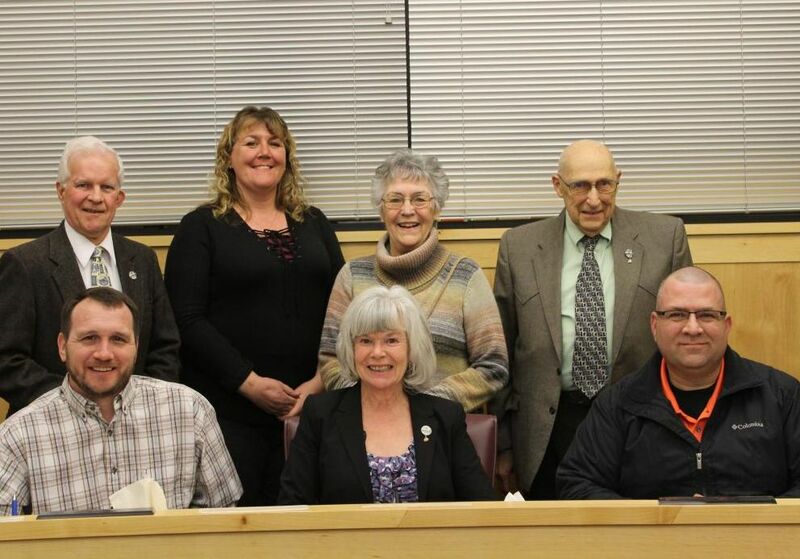 Mayor Betty Roppe says after a decade on Council, Seley felt he couldn’t complete his term. She tells KBND News, "He said that he was very conscientious about making sure he could provide all the needed attendance to everything that is going on. And, he’s finding that as he gets older, his health is not as good as it was, and he’s not fulfilling those needs; in his opinion." Mayor Roppe is hopeful to have a new Councilor appointed by the end of the month. "The person who fills that position is somebody we want to have a really strong desire to work for the benefit of the city. This is a non-paid position. And, we want them to help make the decisions that run the city." Applications are available at City Hall and are due by 5 p.m., September 15. "I and the remaining councilors will review all of those applications. We will probably ask those people to come and be interviewed. Then, the remaining six of us will each have a vote on who we would choose." That person would complete Seley's term, which ends in December 2018. 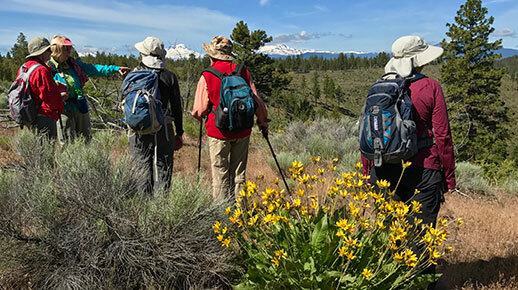 BEND, OR -- Central Oregon LandWatch has launched an initiative aimed at improving Bend's Central District. The group believes the district - bordered by Revere Avenue, 4th Street and the railroad - has too few family-friendly opportunities. Moey Newbold, with LandWatch, says the "BCD Initiative" will help achieve the City's goal to transition the area from industrial to a more urban neighborhood. "This was an opportunity area in Bend's Urban Growth Boundary that was actually rezoned to Mixed Employment and it has its own overlay district for code to have the opportunities that the City has on the Westside but definitely have their own flavor and be accessible to Mid-Town residents and East-siders." 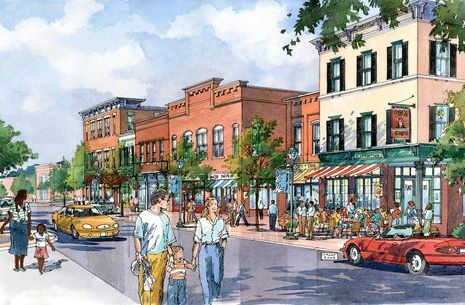 The group is looking for opportunities to create a walkable, bikeable community that safely connects East and West Bend, and Newbold says, "It's focusing on this area that's just East of Downtown, and improving the ways that Eastside residents can access Downtown, whether they're walking or biking or driving. You know, local, and building on what's already there with the Maker's District, and just giving those opportunities for new different types of uses." 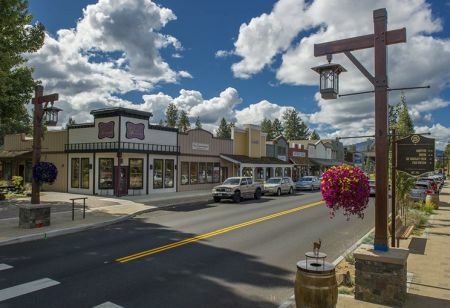 The BCD Initiative was crafted by a group of planners, transportation engineers, urban designers, and architects in an attempt to provide a community vision for the area and Newbold says that though this area of Bend isn't particularly family-friendly, it has a lot of promise. "Most of the land in this area is pretty underdeveloped, and so some of the ideas that we've had [is] to connect East and West Bend, so we feel like if the City could improve that atmosphere, there's a real potential for people to live super close to Downtown." The Bend Central District has historically been a place for people with strong ties to the industries that built Bend, and the BCD initiative wants to celebrate that spirit in a new way. BEND, OR -- A Southwest Bend home suffered about $5,000 in damage in a Tuesday morning fire. According to Bend Fire, someone placed a towel too close to a sauna heater. 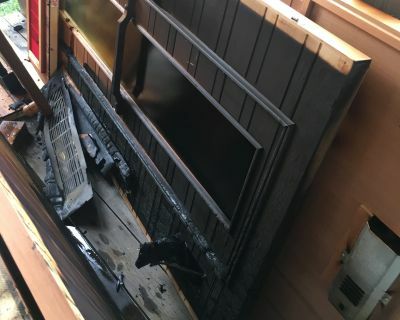 Damage was largely confined to the sauna, with minor smoke and water damage to the house. The homeowners smelled smoke before alarms sounded. Investigators say the three-story home was built in 1995 and only had its two original smoke detectors. Officials say they typically have an effective life of 10 years and should be replaced every decade. 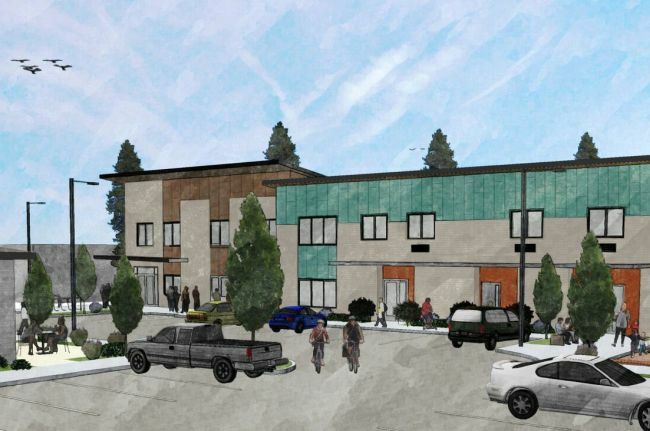 BEND, OR -- Central Oregon’s largest homeless shelter will break ground this week on an expanded facility in Bend. Bethlehem Inn Executive Director Gwenn Wysling says they’ve raised over $5 million, which is enough to get started on Phase One. "The construction process began in June when we demolished our old lobby area and the 1960s administrative offices that we’ve been working out of for the last 10 years." Wysling says services won't be interrupted during construction. "We installed some temporary trailers that we’re working out of now. They have been an amazing upgrade from what we were working out of before." She tells KBND News, "As our volunteers come in and experience the new dining facilities and kitchen prep area, they’re blown away. And so, this is just one step towards what we’re working towards in our new facility. Our residents are so much appreciative and grateful for this improvement." She says the current facility in an old motor inn on North Highway 97 in Bend has long needed to be replaced. This first phase of development is expected to take about a year to build the 18,000 square foot service hub with room for 10 families. Currently, the shelter has five family units. And, a new commercial kitchen will allow volunteers to prepare hot meals on-site, something they’ve never been able to do. "The new facility is going to have a commercial kitchen in the middle, with family dining on one side and singles dining on the other, so it allows us to actually serve the full capacity. We only have the capacity to seat about 40 people right now, and the families dine in their own little dining room – a hotel room. That is going to expand and give us the full capacity to serve the 90-100 people we’re serving a night." Phase two is still in the design and fundraising stage. It will eventually increase the number of housing units for single men and women. PRINEVILLE, OR -- The Prineville Soroptimist Senior Center was over-flowing with food, last week, after the end of the Symbiosis eclipse event at Big Summit Prairie: "A lot of fresh vegetables: cucumbers, broccoli, cauliflower, green onions, limes, gingers; fresh eggs – about 9,000 eggs; several cases of milk, yogurt, cottage cheese, several cases of hamburger, fish and chicken, and frozen veggies." Myra Martin is the Kitchen Supervisor and head Cook at the Senior Center. She tells KBND News she got a call from an event catering company, asking if she would accept a donation so they didn’t have to take the leftovers to the dump. But, she says she had no idea how much they were bringing until the truck rolled up. Martin estimates the total value of the donated food to be around $15,000. "We have a freezer and refrigerator that’s slammed full. The meat will last estimated 3-6 months. And the refrigerated stuff will have to be used in the next 2-3 weeks." The senior center received so much food, Martin was concerned they wouldn't use it all before it spoiled, so they offered it to their clients. "[We] Let them pick through all of the veggies to get what they want to take home, because a lot of the older seniors actually can stuff. And then, we did Redemption House, they came in and took stuff. And, we also did several families here in town that were in need, and we just let them come in and get all the veggies that they wanted." The rest, she says, will be used over the next several months for the estimated 200 meals a day the senior center provides. "It helps us tremendously," Martin says. "On the food cost; because we’re a non-profit, what we make is what we buy groceries with, to feed the seniors and the home delivery meals." BEND, OR -- Bend Police say a drunk driver eluded capture Monday night, before he ran up on a curb with a flat tire and was arrested. An officer observed an SUV commit several traffic violations, at about 8:30 p.m., near 9th and Newport. When the officer activated his overhead lights, the car ran over a curb and a portion of a yard. The officer didn't pursue the driver, out of safety concerns. About five minutes later, a witness reported seeing an SUV speeding near NW Idaho and Wall Street. The car hit a curb and had a flat tire. Police believe it was the same car from the earlier call. Just before 9:30 p.m., officers found the vehicle parked up on a curb near NW Sisemore and Delaware; 29-year-old Michael Street was with the car. He's charged with attempt to elude, DUII and Reckless Driving. 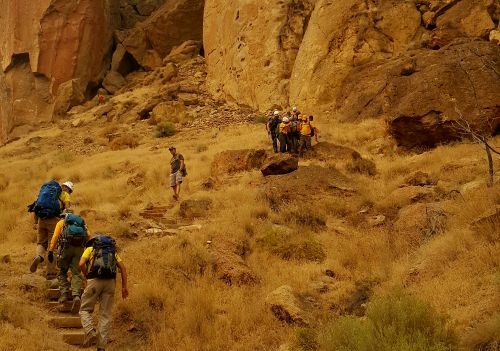 TERREBONNE, OR -- Deschutes County Search and Rescue responded to Smith Rock State Park, Sunday afternoon, to help a climber injured in a 20-foot fall. The 31-year-old Portland woman was climbing with a belay, but when she lost her hold there was too much slack in the line. She hit the ground before the belay could stop her fall. She was brought down the steep trail from Cocaine Gully in a wheeled litter and was later released to seek her own medical treatment. 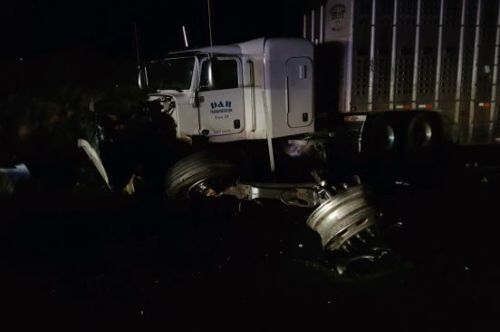 PRINEVILLE, OR -- A 41-year-old Prineville man was killed in a crash early Saturday morning. According to Oregon State Police, William McCloughan had been seen riding his motorcycle recklessly at high speeds, at about 2:30 a.m.
Minutes later, he failed to obey a stop sign at Woodward Road and Highway 26, crossing the highway in front of a semi tractor-trailer. The truck was unable to avoid hitting the motorcycle. After the collision, the truck overturned, blocking the eastbound lane and injuring the truck driver. Highway 26 was closed for five hours for the investigation. 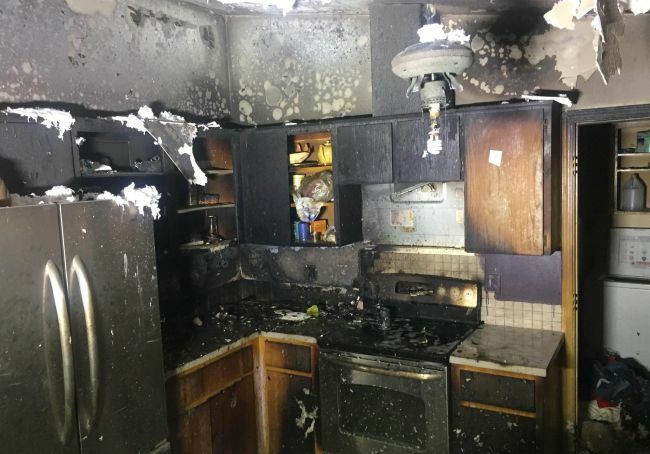 BEND, OR -- Bend Fire & Rescue says combustibles placed too close to the oven started a Friday night fire that caused about $15,000 worth of damage. The Red Cross is helping the adult and two pets displaced by the blaze on Navajo Road. According to the fire department, crews arrived just after 8 p.m. and fire in the kitchen and smoke throughout the home. They quickly controlled the fire to prevent further damage. Smoke detectors were not working at the time. PRINEVILLE, OR -- A San Francisco woman launched a campaign to get cigarette-makers to switch to biodegradable filters after attending the Symbiosis eclipse event at Big Summit Prairie, in Crook County. Julie Mastrine has collected more than 12,000 signatures through an online Care2 petition and she's submitted her idea to Reynolds America, which sells 28% of cigarettes in the U.S. "The event was amazing and the people there were generally very conscious, wanting to protect the environment, and really respectful, but I did see cigarette butts littered, particularly around the campsites, so one of the other festival attendees noted this and she said, 'why don't cigarette companies make biodegradable filters?' and I thought that was a really good idea and started the petition because of that." She said she was disheartened by the casualness of many smokers when it came to discarding their butts. "It's a very strange culture among not all but some cigarette smokers. 'Leave No Trace' is a mantra that's really a cornerstone in the festival culture, for festivals like Symbiosis or Burning Man or whatever, and people generally abide by that, I would say. But, among cigarette smokers there's this element of nonchalance about it that's really disturbing." Because Mastrine believes that changing a product is much easier than trying to change the culture of smokers, she launched an online petition to request tobacco companies switch to biodegradable filters. "The companies themselves could just definitely be more mindful of the impact of their products - and that goes for any company, cigarettes or not cigarettes - if you could make your packaging more earth-friendly, then why wouldn't you do it?" 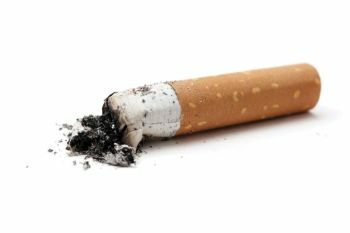 Globally, cigarette butts account for 1.7 million pounds of waste annually. 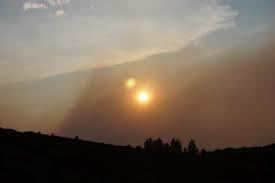 SISTERS, OR -- No new local fires were reported Thursday, and air quality was much improved by evening; however, fires burning across the region are expected to send more smoke into Central Oregon, this weekend. Locally, the McKay Fire (pictured), east of Highway 97 in southern Deschutes County, remains just over 1,200 acres in size, and is 50% contained. 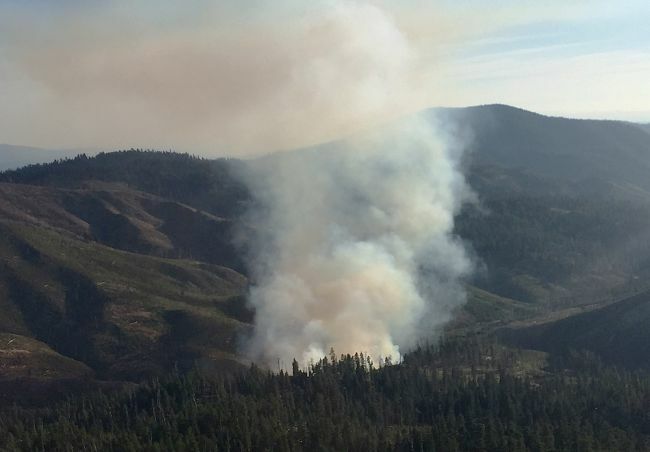 The Nash Fire, in the Three Sisters Wilderness, is about 2,250 acres. Level two evacuation warnings remain in place for Elk Lake Resort and surrounding areas, as well as Level one alerts for Lava Lake Resort and campgrounds. And, the Milli Fire, near Sisters is 44% contained at 22,718 acres. Meteorologists expect the relative humidity to drop Friday, and Saturday will be extremely warm and dry, increasing the fire danger for the holiday weekend. 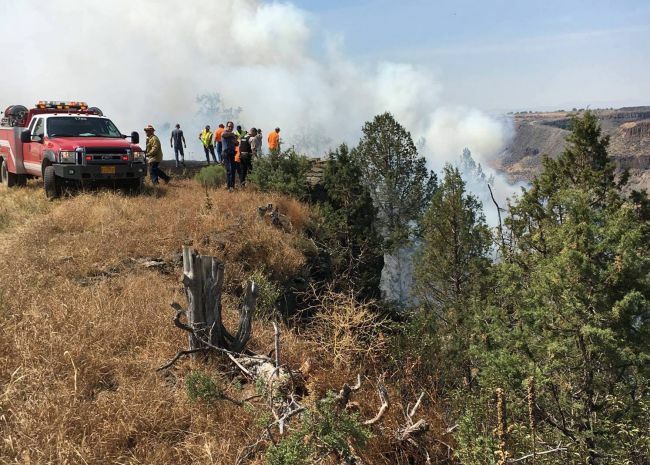 SISTERS, OR -- Those driving between the Willamette Valley and Central Oregon will encounter delays, due to firefighting efforts. Along Highways 22 and 20, from Detroit Lake to Sisters, active wildfires are causing road closures and delays. Those driving Santiam Pass through the Labor Day holiday weekend are encouraged to check Tripcheck.com for the latest traveler information. Just west of Santiam Pass, the Oregon Department of Transportation is using a pilot car to direct two-way traffic for 1.5 miles. 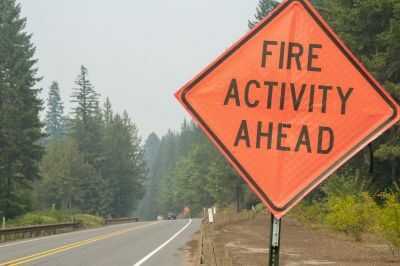 Drivers should expect flagging with a pilot car, between 7 a.m. and 7 p.m. During the day, wildland crews are cutting burning snags, using helicopter water drops and moving equipment, which is impacting highway travel. Both lanes are open overnight, although the situation could change based on fire activity. Delays are expected to continue over the weekend, as temperatures soar and the fire behavior and fire danger increases. 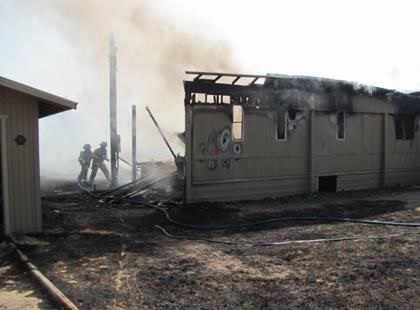 LA PINE, OR -- A La Pine home was destroyed by fire, Thursday afternoon. Investigators believe a blown circuit-breaker on an outside electrical panel ignited dry grass, just after 3:30 p.m. The fire quickly spread to the house on White Buck Ave., detached garage and surrounding area, causing a quarter-acre grass fire. The one woman home at the time was able to safely evacuate. 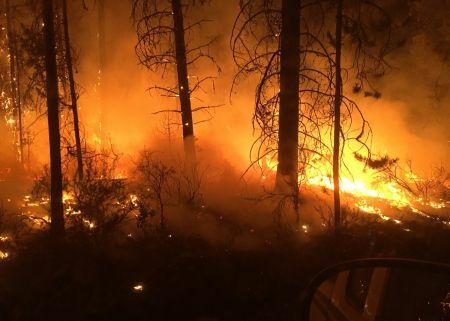 Firefighters from La Pine, Sunriver, Oregon Department of Forestry and the US Forest Service worked for more than three hours to extinguish the blaze. PORTLAND, OR -- For the first time ever, Cycle Oregon has canceled its annual ride. About 2,000 participants were scheduled to ride through areas like Tumalo, La Pine and Diamond Lake, starting next weekend. But, smoke from wildfires burning through the state forced event organizers to shut it down. They say the route would be affected by smoke fiver out of seven days. 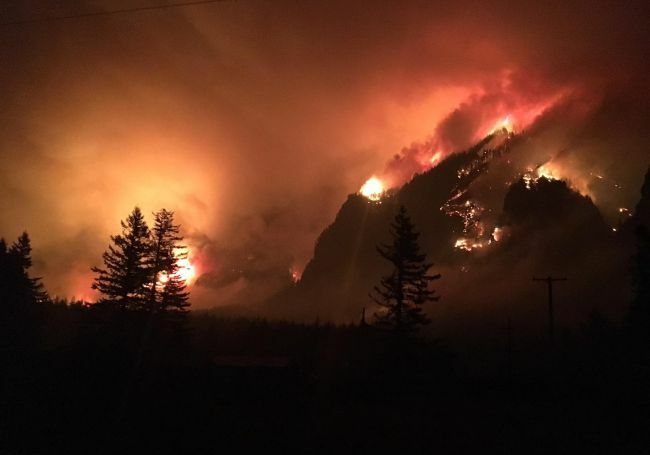 They considered changing the route, but after discussions with the Oregon Department of Forestry, the US Forest Service, Bureau of Land Management and Oregon Department of Transportation, event managers decided it was safest to cancel. Executive Director Steve Schultz posted a message on their website saying they're working on what to do next, and hope to have answers by next Wednesday. The ride was supposed to start September 9 and covers nearly 500 miles across Oregon. BEND, OR -- Sisters Schools started back a day late, this week, due to the smoky conditions; the rest of the region’s districts are slated to begin next week, but pre-season sports are already underway and feeling the effects of the poor air conditions. Bend-La Pine Schools Deputy Superintendent Jay Mathisen says Athletic Directors are making changes based on guidelines set by the Oregon School Activities Association (OSAA). "We are able to access a local reading for air quality, and based on the measurements and guidance from OSAA, we make decisions on whether we have practice or not, perhaps what types of activities are OK during practice times. And, we’re able to check those conditions pretty fluidly, here, locally." He tells KBND News, "We’ve canceled some contests and we’ve adjusted some activities and practices, and canceled some of those in some of these worst hours that we’ve experienced in the last week. And then, we’re closely monitoring future contests and deciding what to do. We’re able to hold more indoor things than outdoor without adjustment, obviously." The district is tracking changes on its website. Mathisen admits it’s unusual for wildfire season to impact the beginning of the school year, but he says they’ll do what’s needed to keep kids safe. "We’ll take readings three hours apart, during the school day; and if there are air quality concerns, we’ll be notifying our elementary school principals around those concerns and asking them to move recess. And, we’ll also be allowing principals at their site to make some decisions, because sometimes in the northeast part of Bend it’s different than it might be in the southwest part of Bend." Photo: Local high school cross country teams compete in Prineville, August 26, 2017.